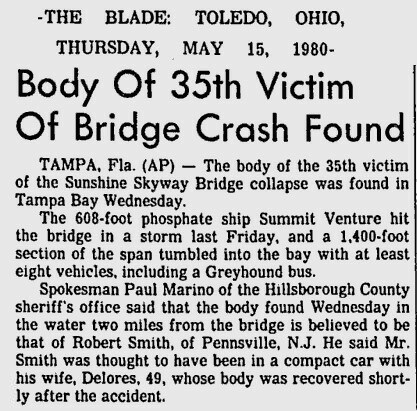 a ship crashes into the skyway and knocks it down, 35 die. offsite links could be broken at any time. 05.09.80: 'summit venture' may-day distress call to the coast guard. 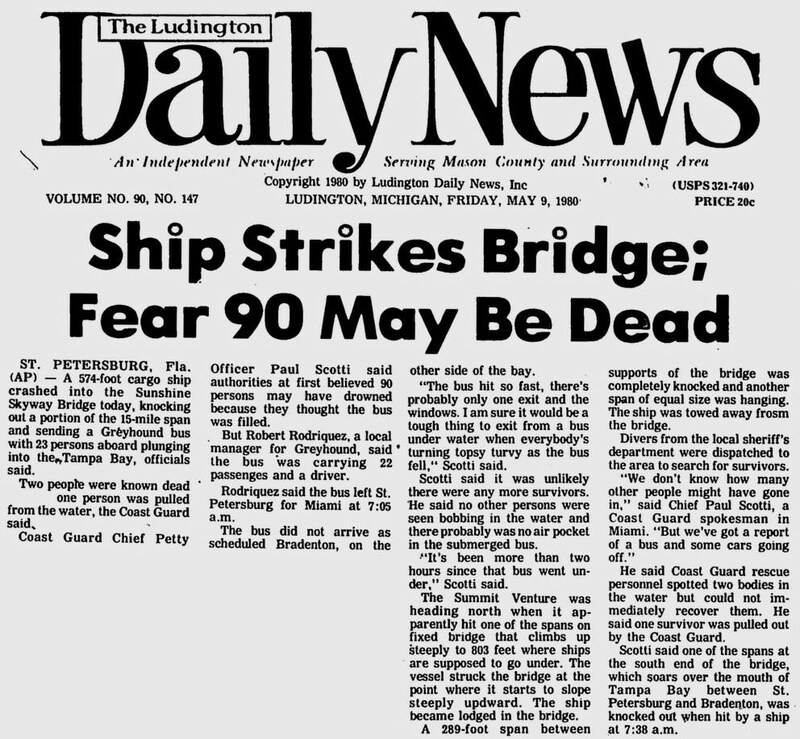 05.09.80: ship strikes bridge, fear 90 may be dead. 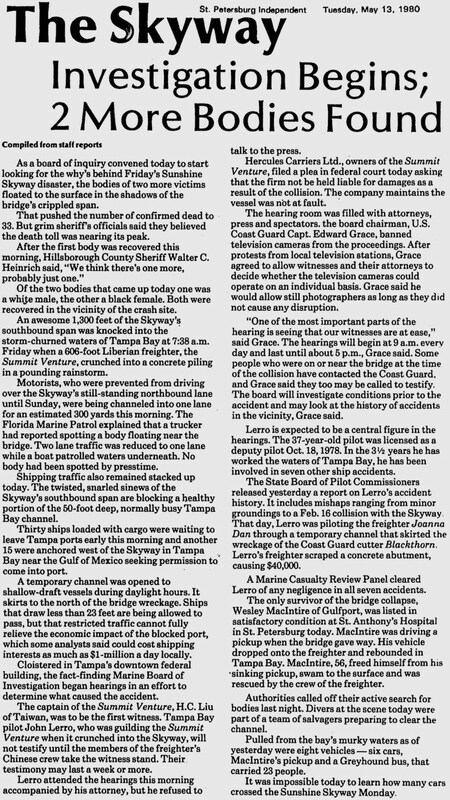 05.09.80: tragedy is third time skyway hit in four months. 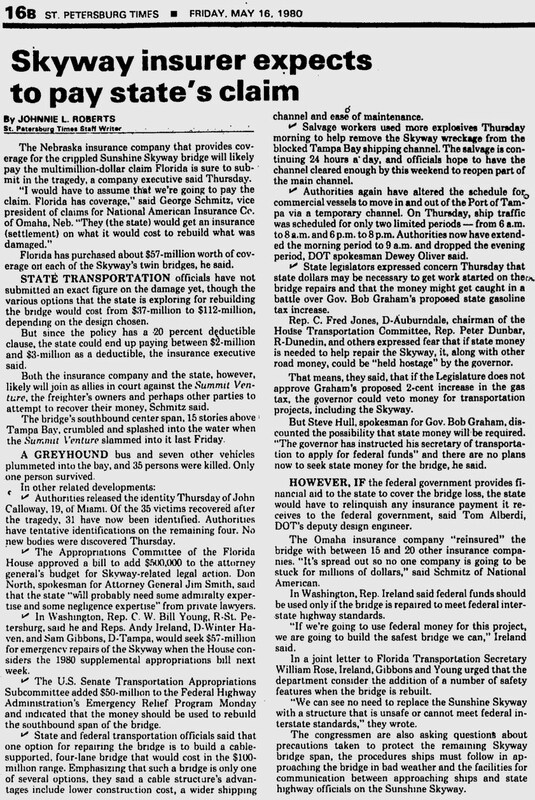 05.10.80: original st. pete times newspaper coverage. 05.10.80: original lakeland ledger newspaper coverage. 05.10.80: officials describe bodies in effort to aid identifications. 05.10.80: a rainy, twisted scene of death: is anyone alive down there? 05.10.80: the curious braved rain for a look at disaster. 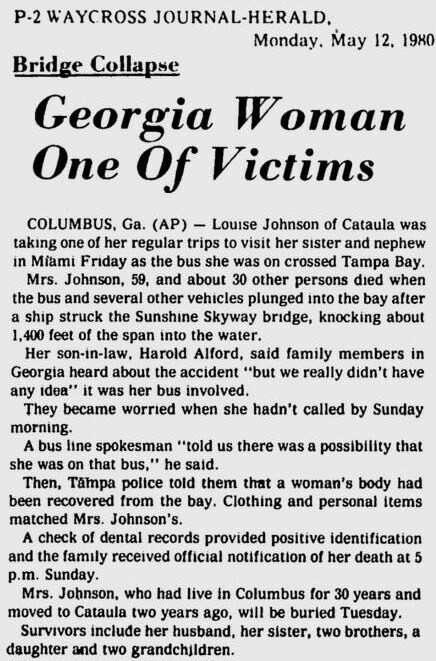 05.10.80: some suggest skyway bridge is cursed. 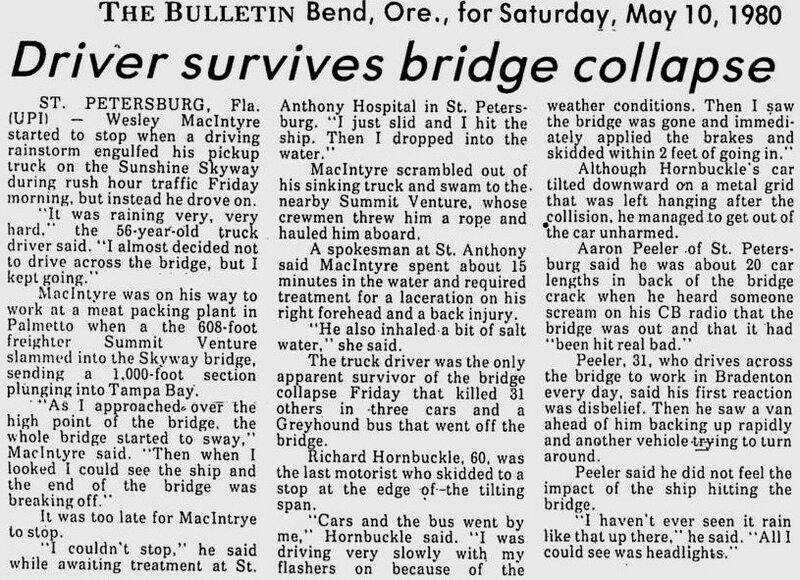 05.10.80: driver survives bridge collapse. 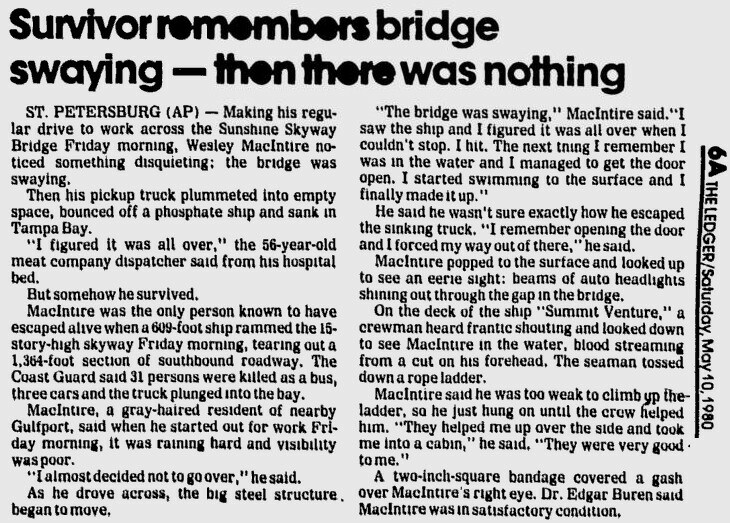 05.10.80: survivor remembers bridge swaying, then there was nothing. 05.10.80: divers find bodies in rubble. 05.10.80: the tragedy that was no accident. 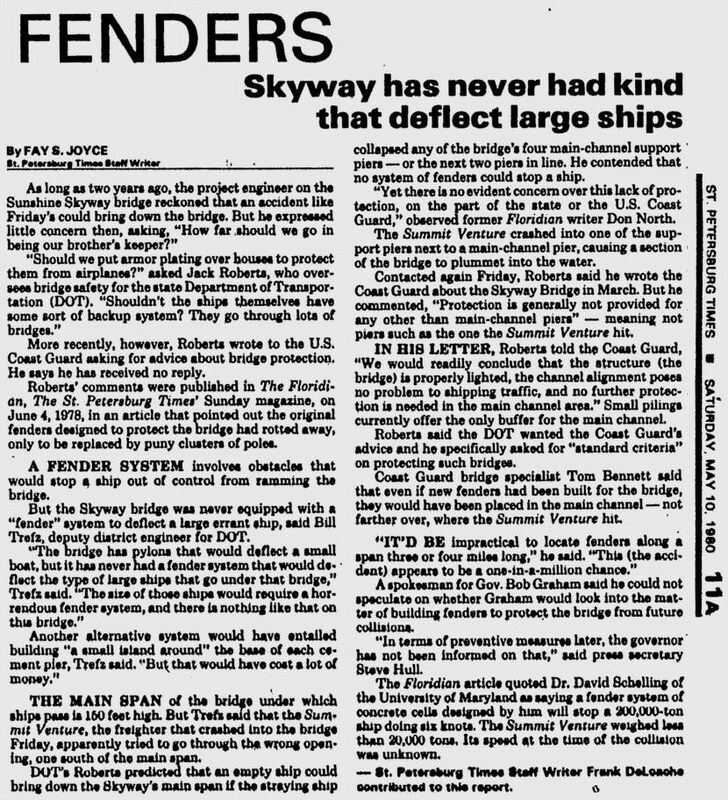 05.10.80: fenders - skyway has never had the kind that deflect large ships. 05.10.80: the bus - it's driver, one who rode it, two who didn't. 05.11.80: same pilot hit bridge in february. 05.11.80: lack of identification hampers naming of victims. 05.11.80: bus driver diverts two girls. 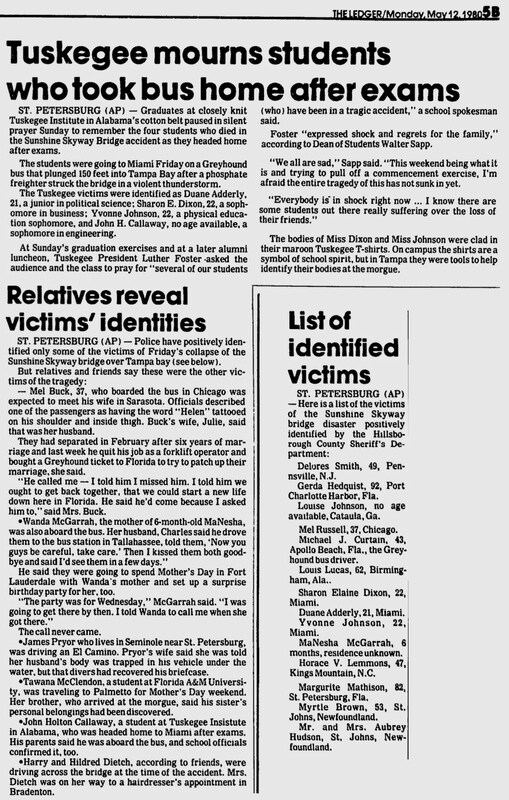 05.12.80: skyway victims - varied memories. 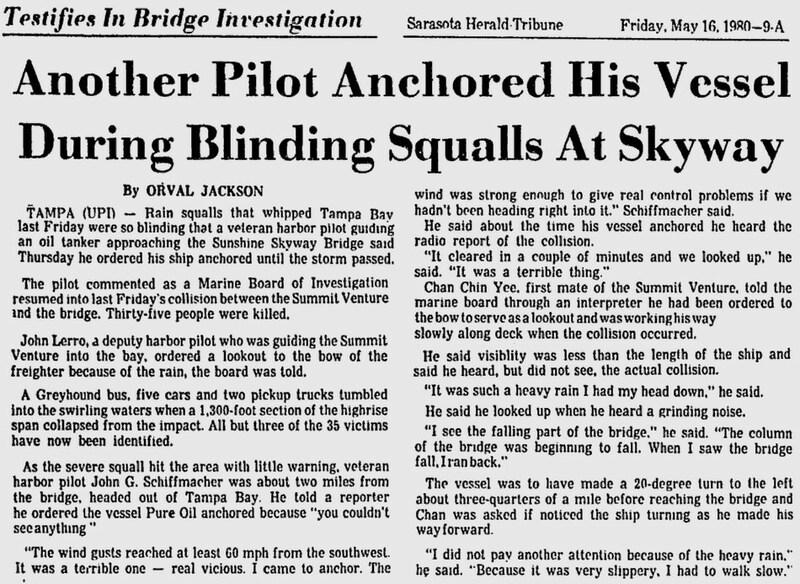 05.12.80: pilot involved in seven incidents before skyway. 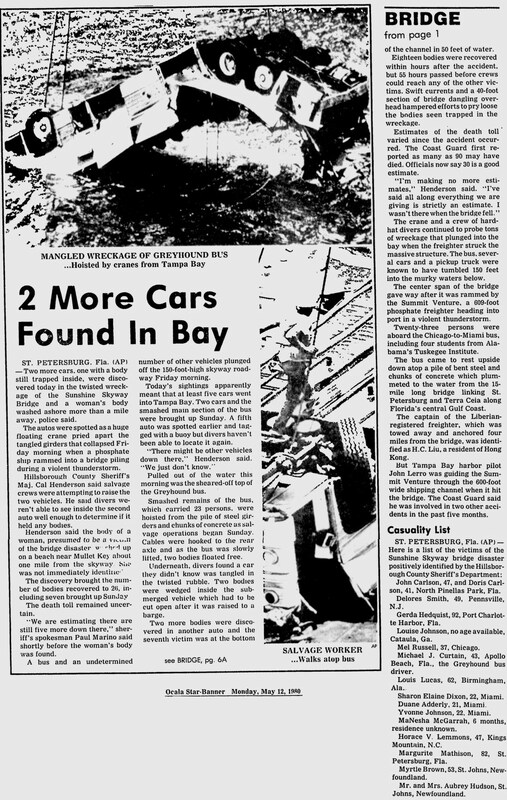 05.12.80: two more cars found in bay. 05.13.80: why a disaster was very likely. reprint of a 06.04.78 article. 05.13.80: why didn't the d.o.t. listen? 05.13.80: channel opened in tampa bay. 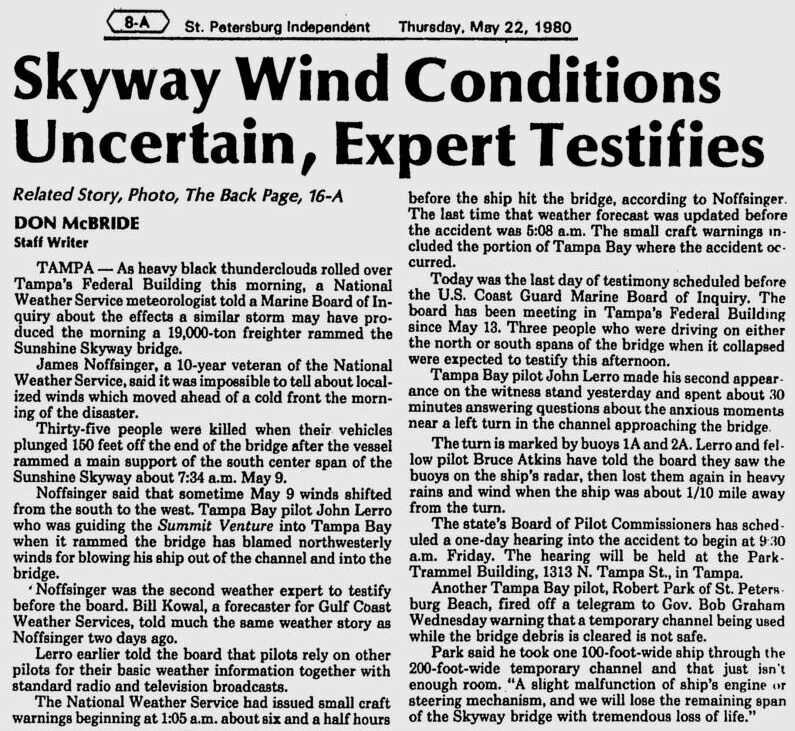 05.15.80: lookout's role examined in skyway disaster. 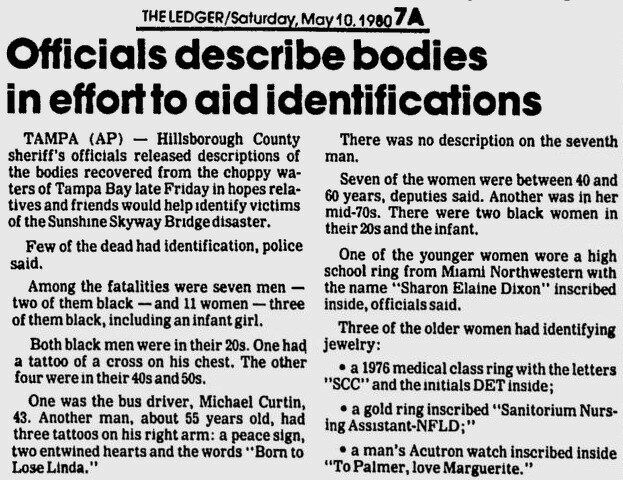 05.15.80: body of 35th victim found. 05.16.80: narrow escape for crewman. 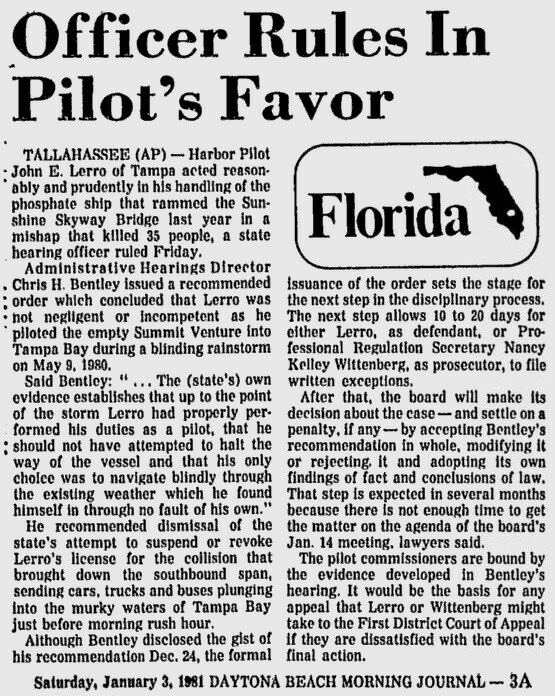 05.16.80: harbor pilot to testify. 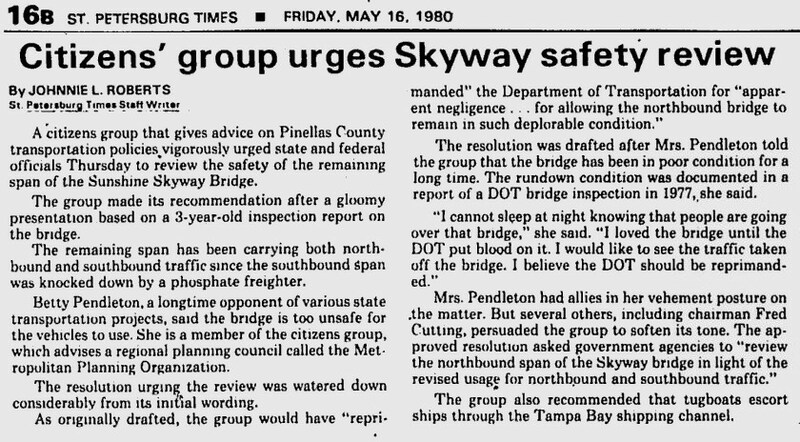 05.16.80: citizens' group urges skyway safety review. 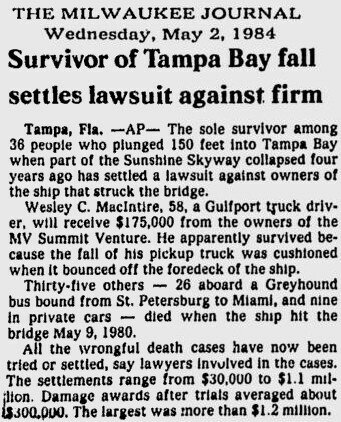 05.16.80: skyway insurer expected to pay state's claim. 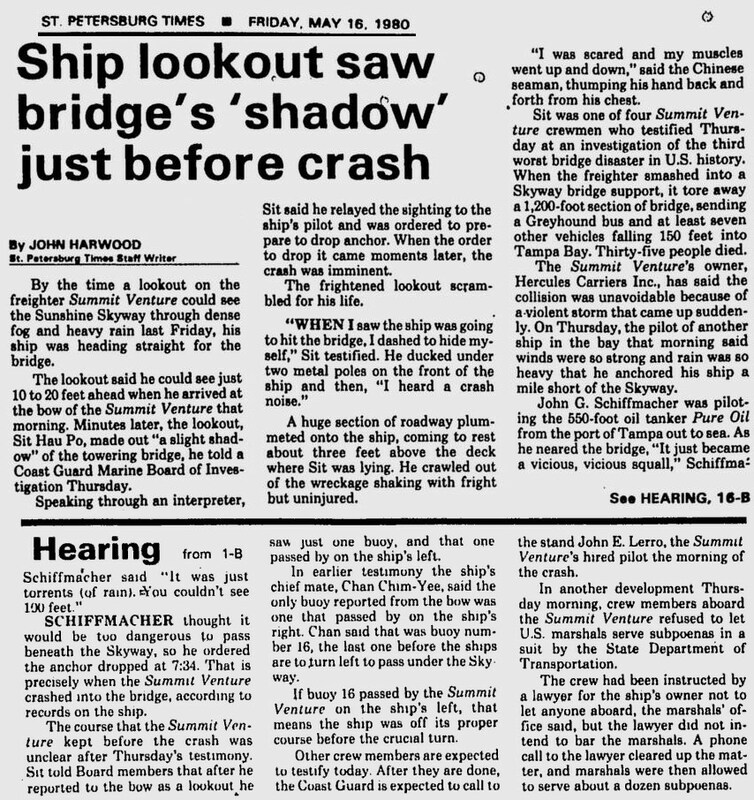 05.16.80: ship lookout saw bridge's 'shadow' just before crash. 05.16.80: another pilot anchored his vessel during squalls at skyway. 05.17.80: i just have to learn to live with it. 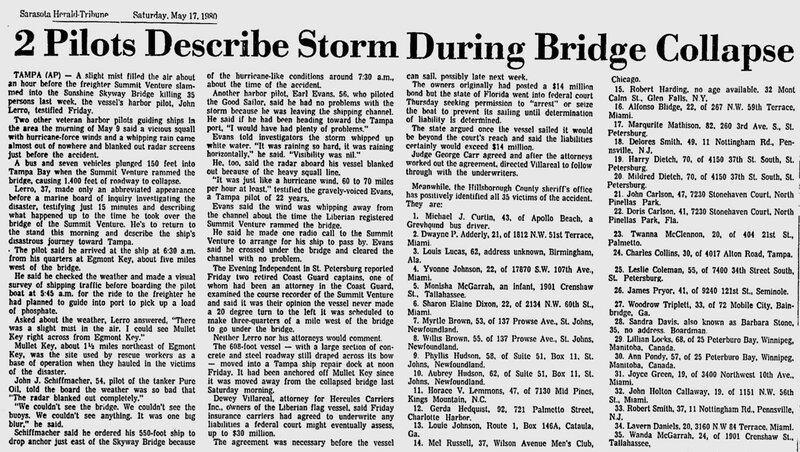 05.17.80: 2 pilots describe storm during bridge collapse. 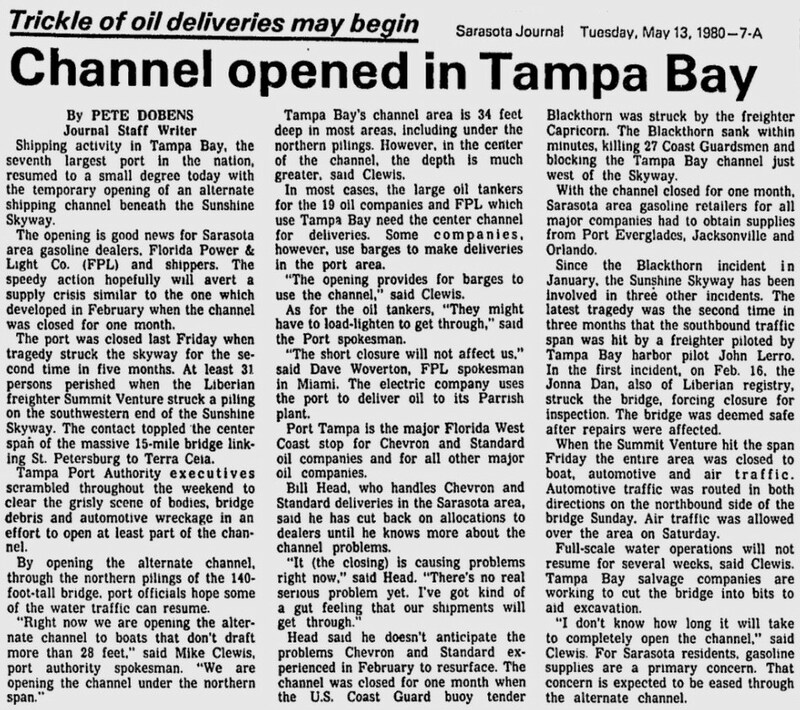 05.20.80: wider channel opened under skyway bridge. 05.20.80: trainee pilot had no hint anything was wrong. 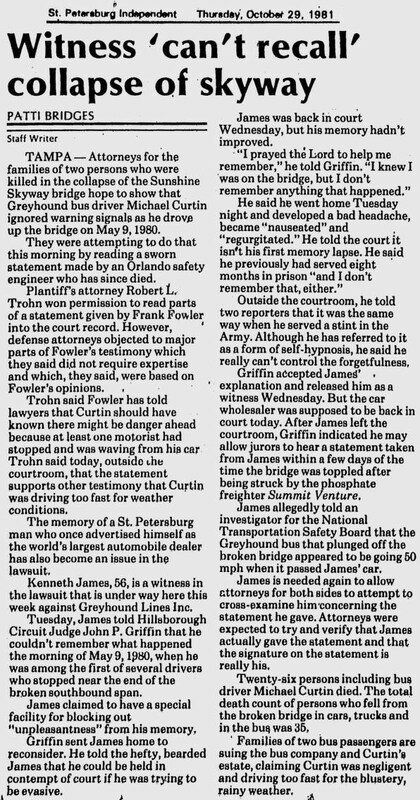 05.20.80: suit filed over death on skyway. 05.21.80: bay traffic resumes since accident. 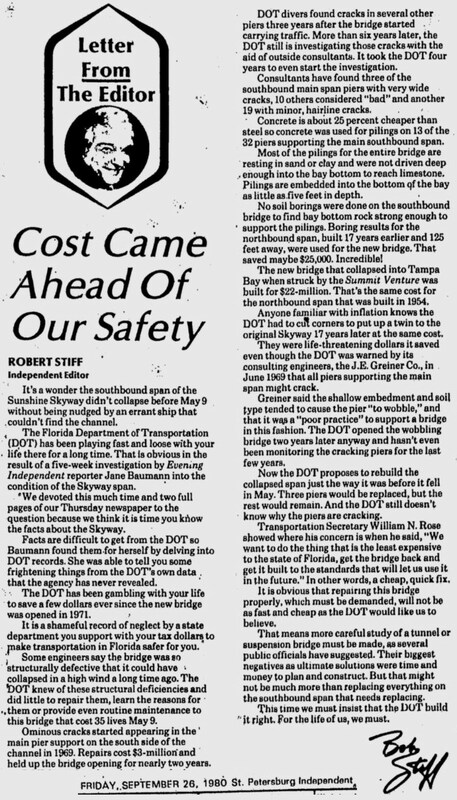 05.22.80: tampa skyway bridge inquiry nearly done. 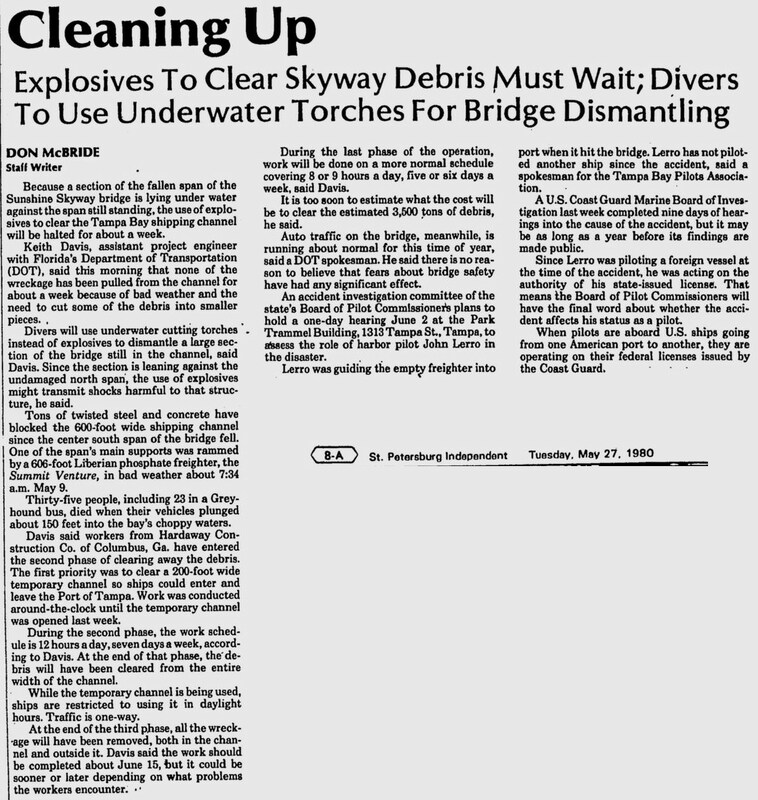 05.27.80: explosives to clear skyway debris must wait. 05.30.80: miscellany - 3 skyway briefs. 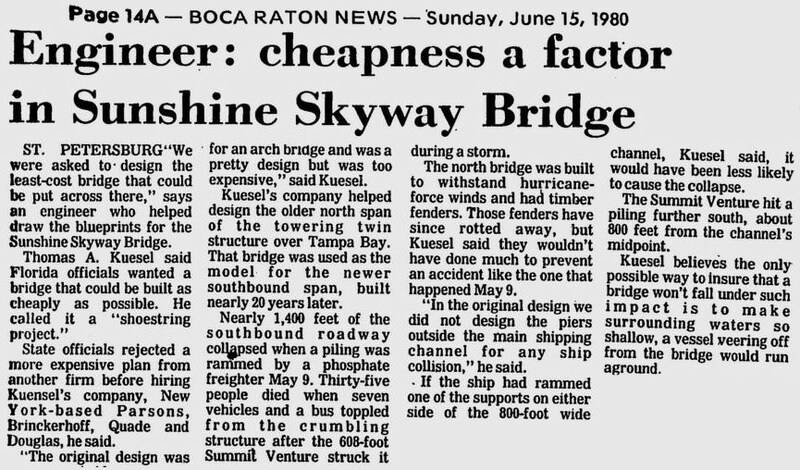 05.30.80: engineer says shortcuts helped bring down skyway bridge. 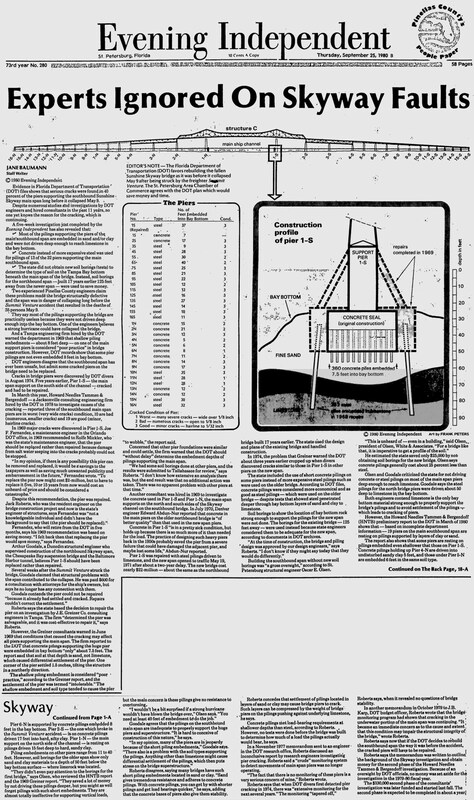 06.15.80: engineer - cheapness a factor in skyway bridge. 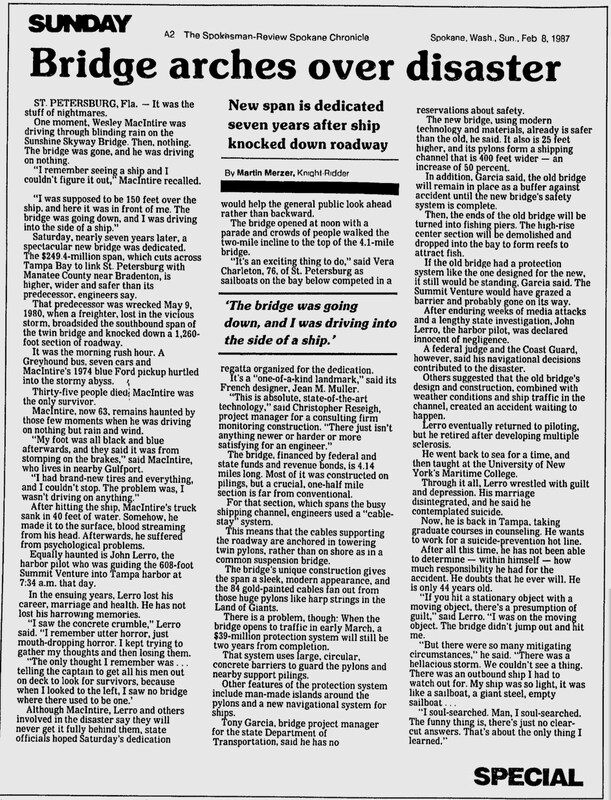 06.18.80: many residents refuse to drive across skyway. 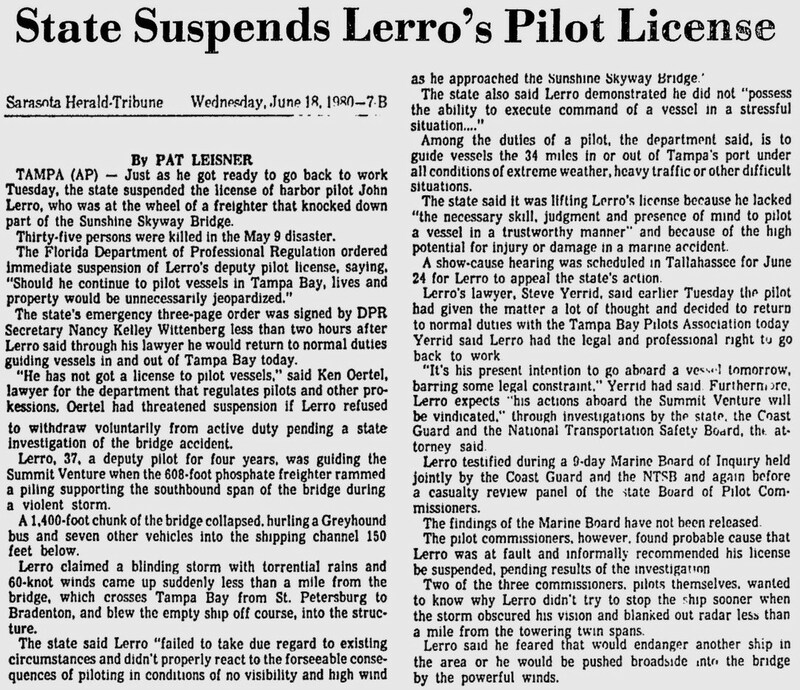 06.18.80: state suspends lerro's pilot license. 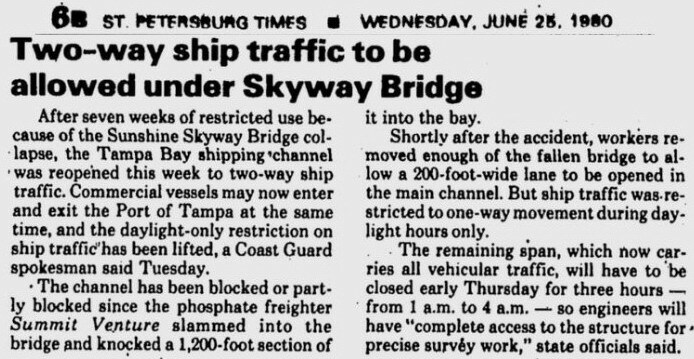 06.25.80: two way ship traffic to be allowed under skyway bridge. 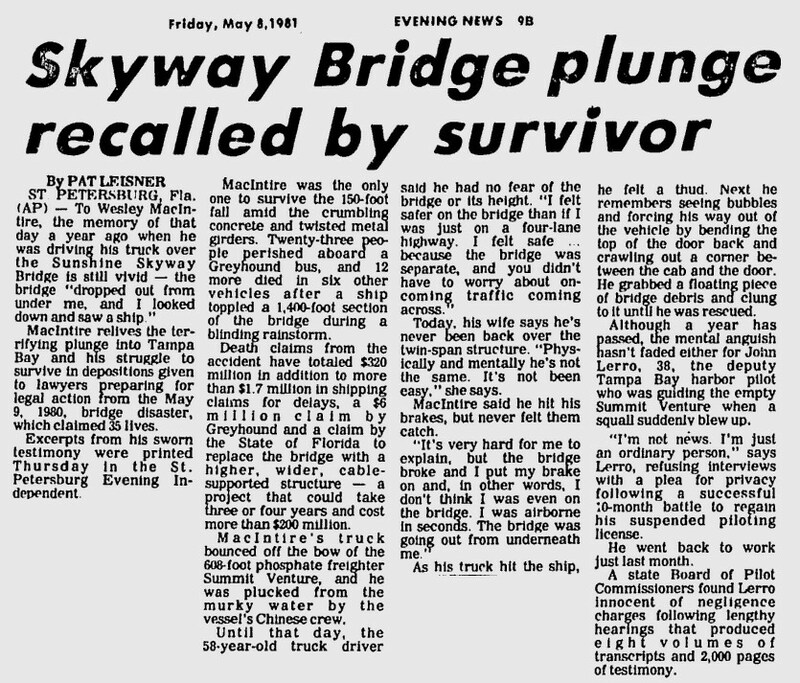 06.26.80: skyway salvage, it's going to cost $2.5 million. 07.01.80: junk dealer offers skyway keepsakes. 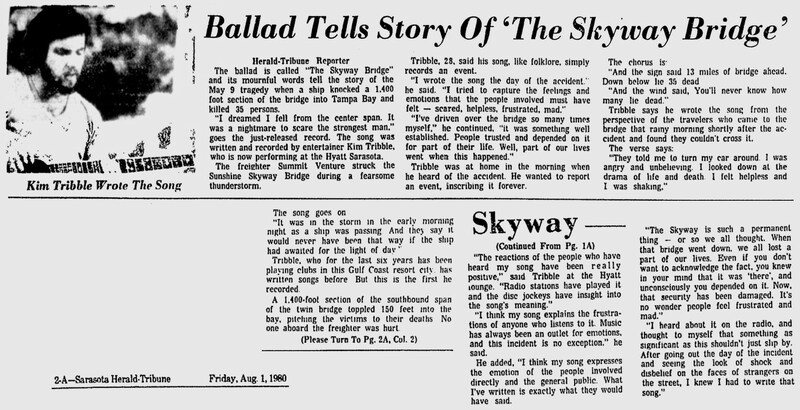 08.01.80: ballad tells the story of 'the skyway bridge'. 08.14.80: legislators oppose d.o.t. 's preference in replacing span. 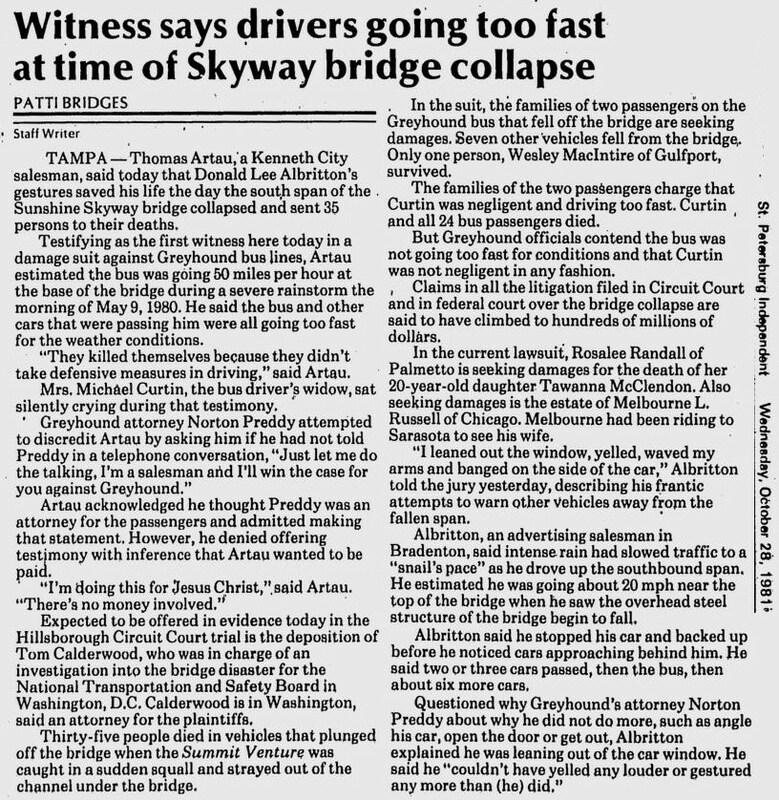 09.25.80: experts ignored on skyway faults. 09.25.80: the history of a tragedy. 09.26.80: skyway cracks found last year. 09.26.80: opinion - cost came ahead of our safety. 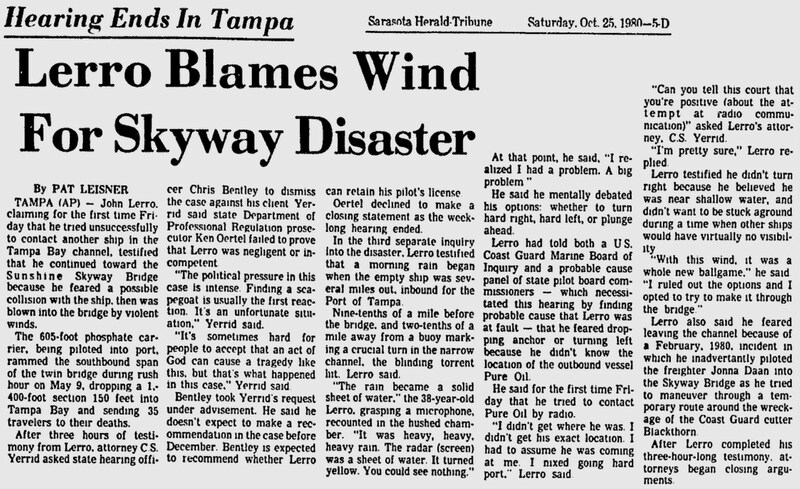 10.25.80: lerro blames wind for skyway disaster. 10.30.80: firm hired to remove remnants of damaged bridge. 11.19.80: freighter ventures back under the skyway bridge. 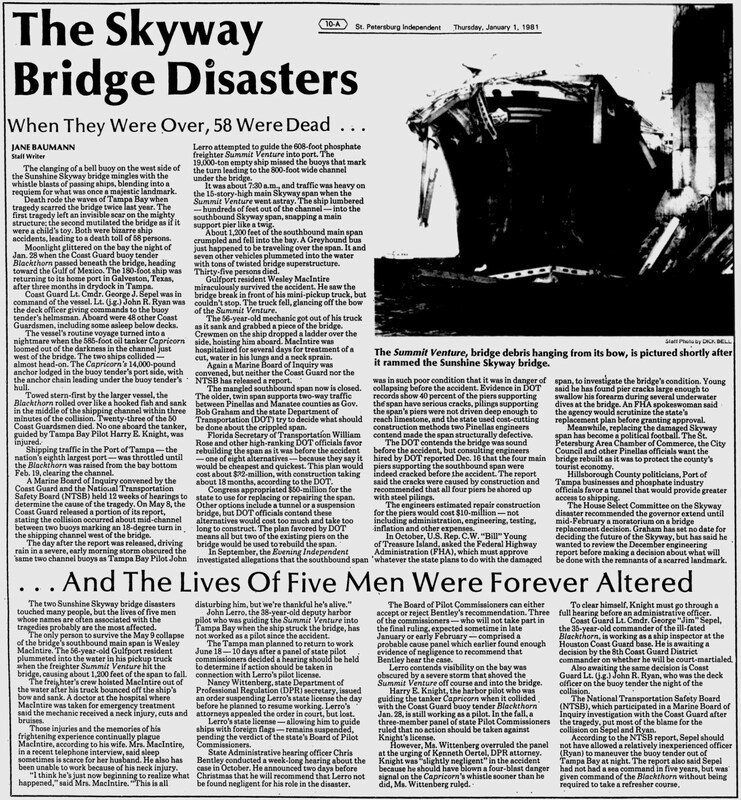 01.01.81: skyway bridge disasters, when they were over, 58 were dead. 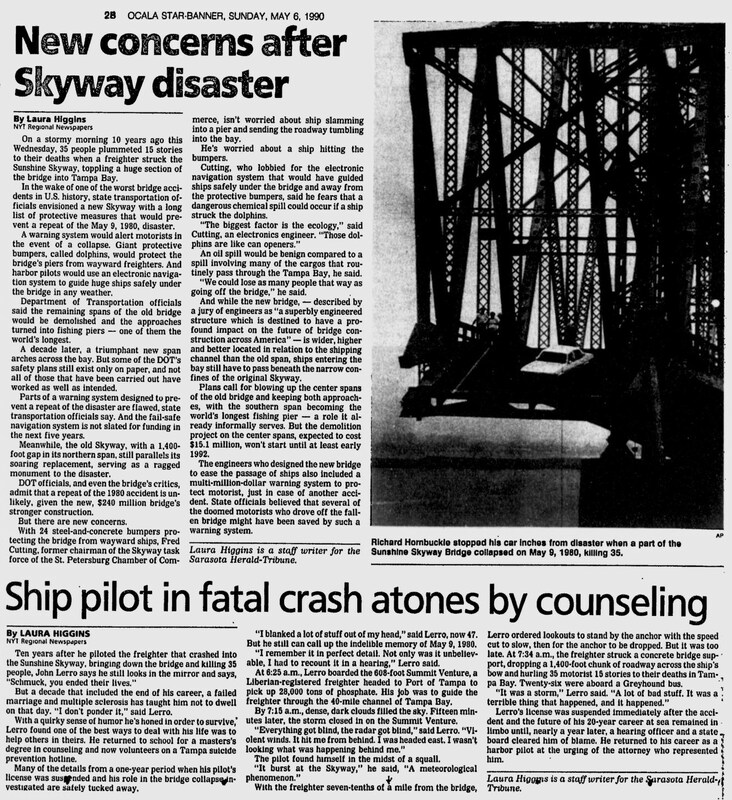 01.01.81: many questions still remain unanswered in skyway tragedy. 01.03.81: officer rules in pilot's favor. 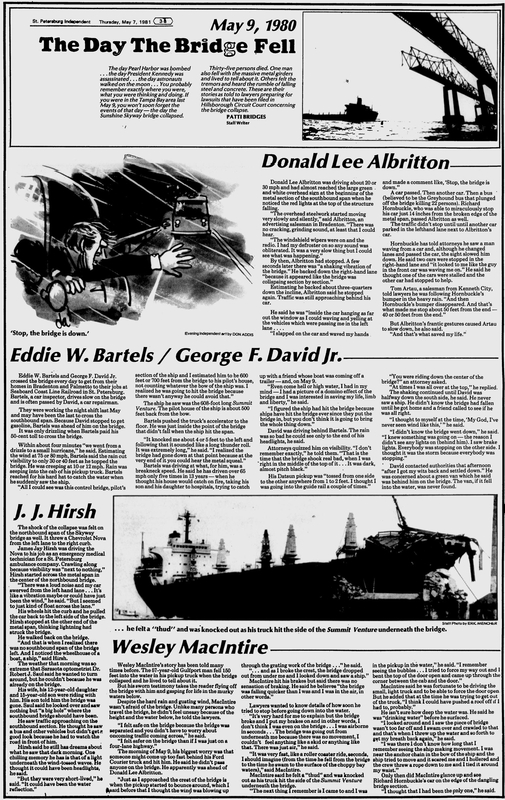 02.09.81: marine board of investigation, detailed 26 page report. 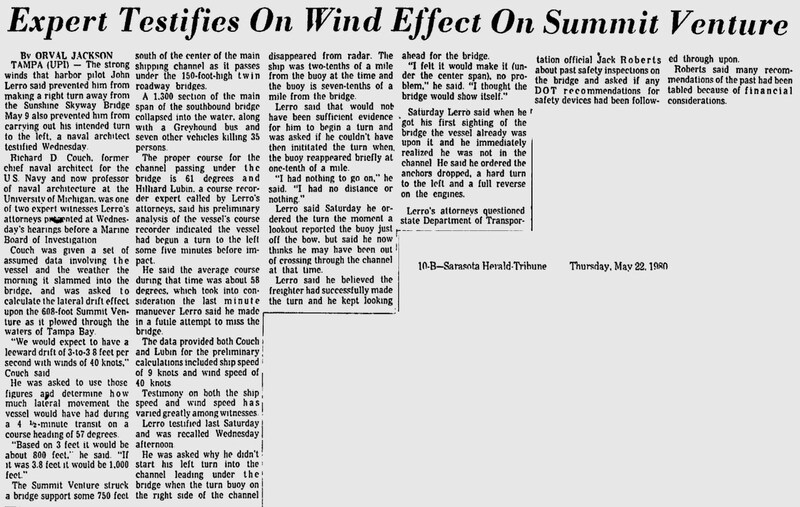 03.05.81: relatives of skyway victims are puzzled over lerro ruling. 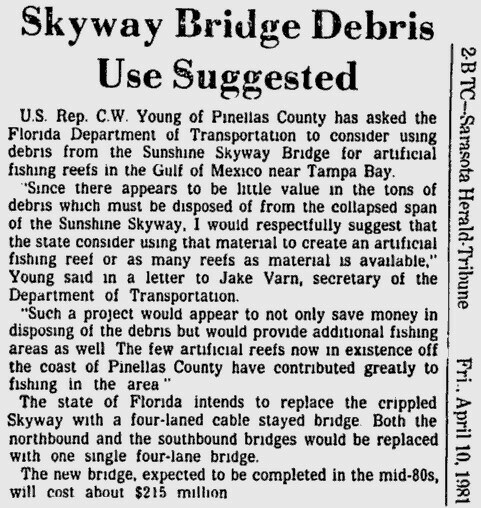 04.10.81: skyway bridge debris use suggested. 04.22.81: national transportation safety board safety recommendations. 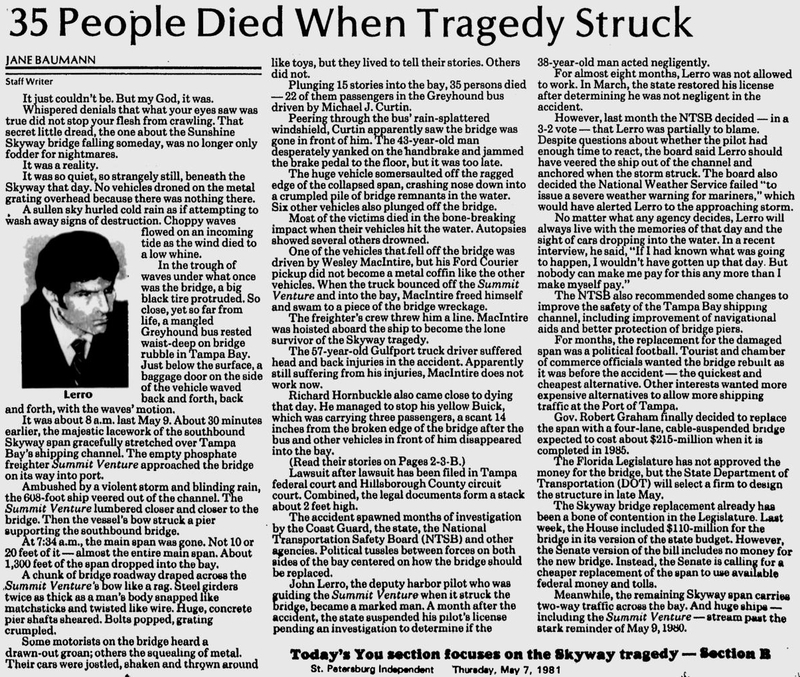 05.07.81: 1 • 2 • 3 'the day the bridge fell', 3 pages of articles. 05.08.81: opinion - a year later, no wiser. 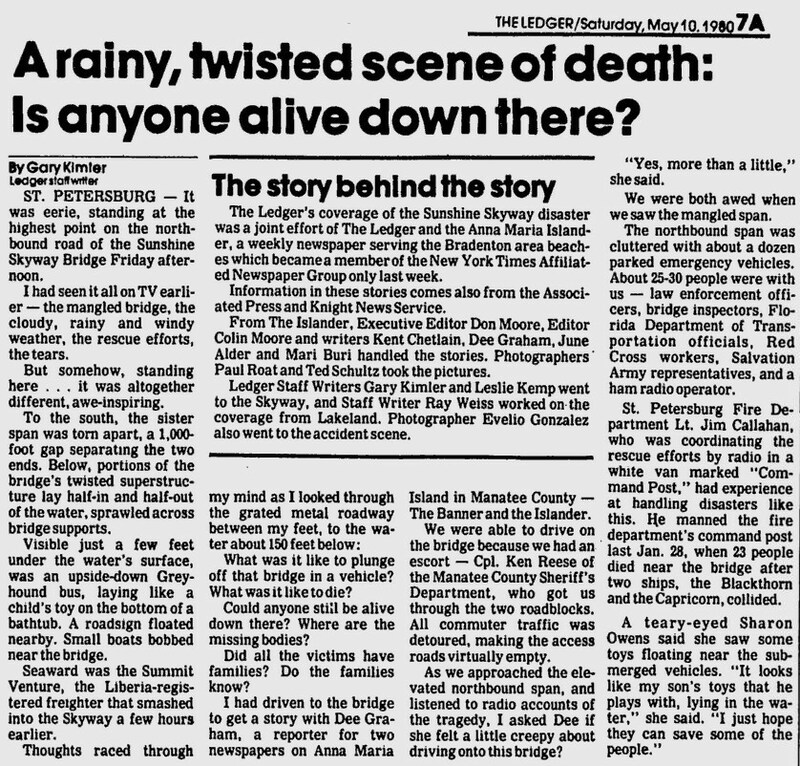 05.08.81: skyway bridge plunge recalled by survivor. 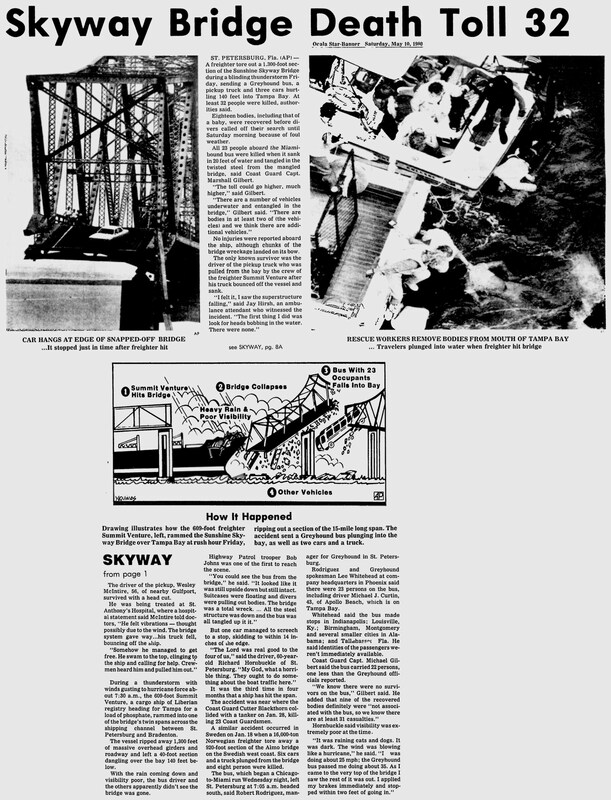 10.26.81: skyway trial set to open today. 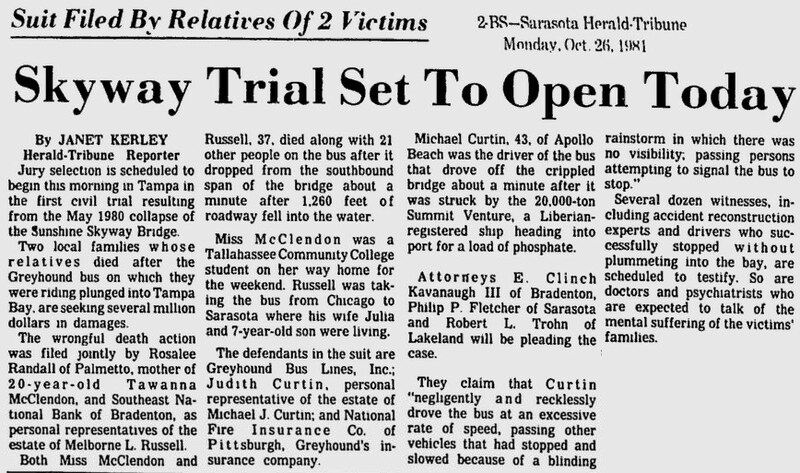 10.27.81: investigator says bus last to fall from skyway span. 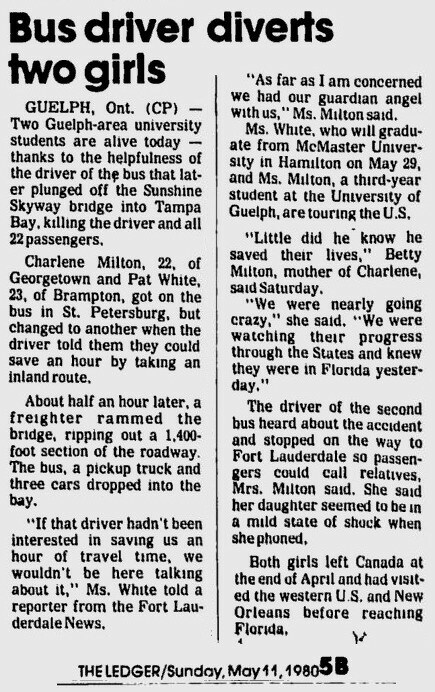 10.28.81: witness says drivers going too fast at time of collapse. 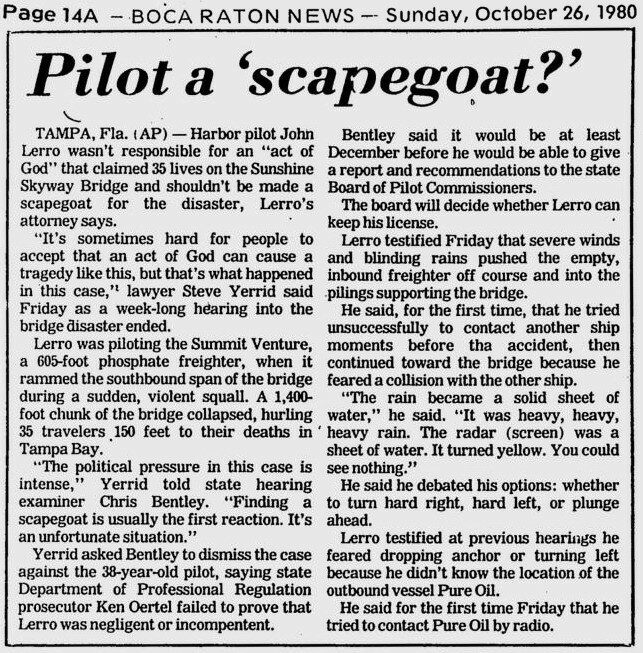 10.28.81: lerro gives testimony at first skyway trial. 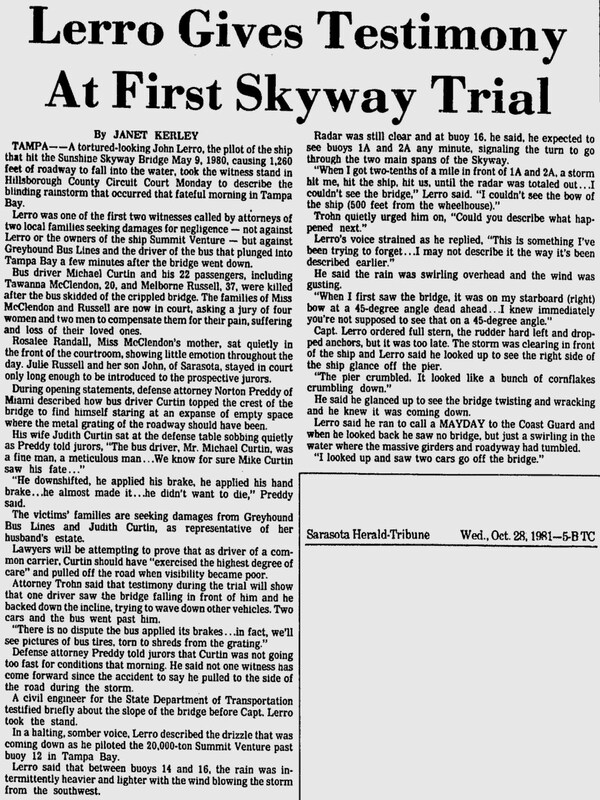 10.29.81: close calls described in skyway trial. 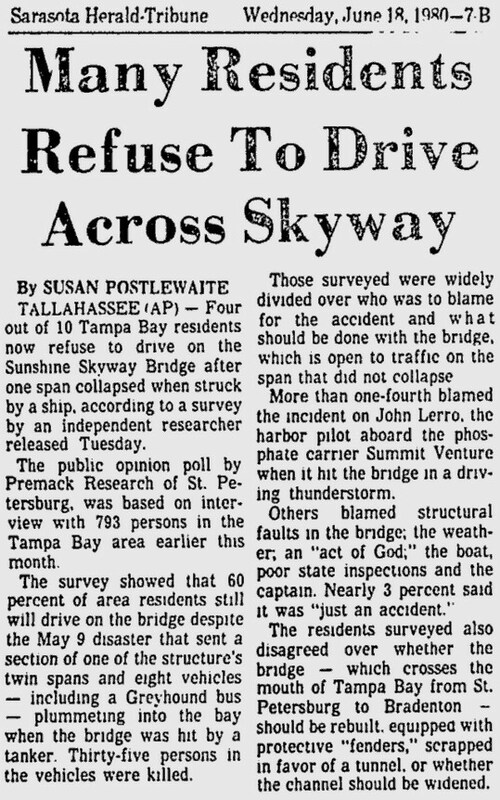 10.29.81: witness 'can't recall' collapse of skyway. 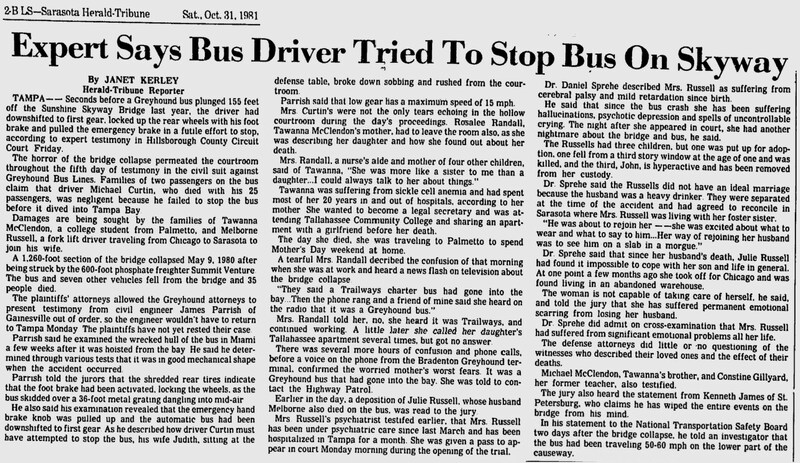 10.31.81: expert says driver tried to stop bus on skyway. 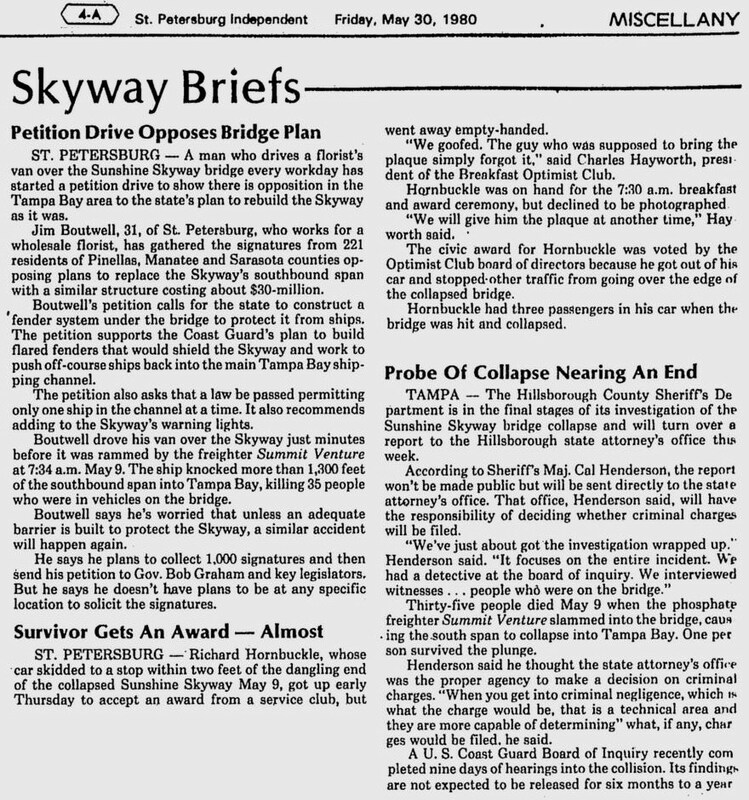 11.03.81: dismissal motion in skyway lawsuit is denied. 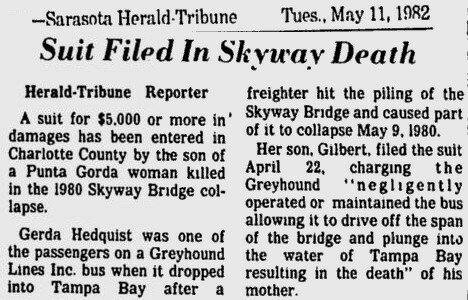 11.05.81: greyhound wins in skyway suit. 04.13.82: those who merely want to rebuild old skyway 'foolish'. 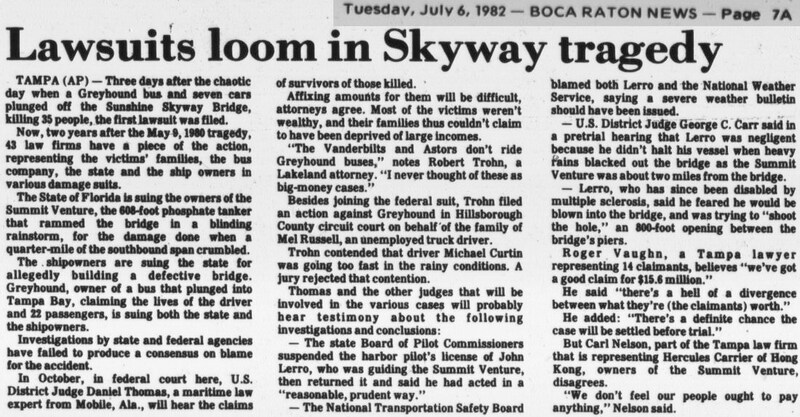 07.06.82: lawsuits loom in skyway tragedy. 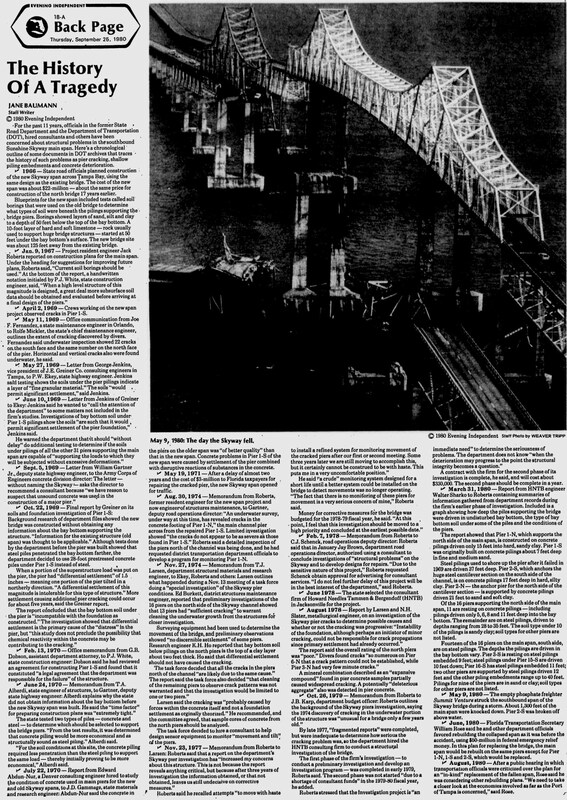 10.13.82: crew's blunders caused bridge fall, lawyers say. 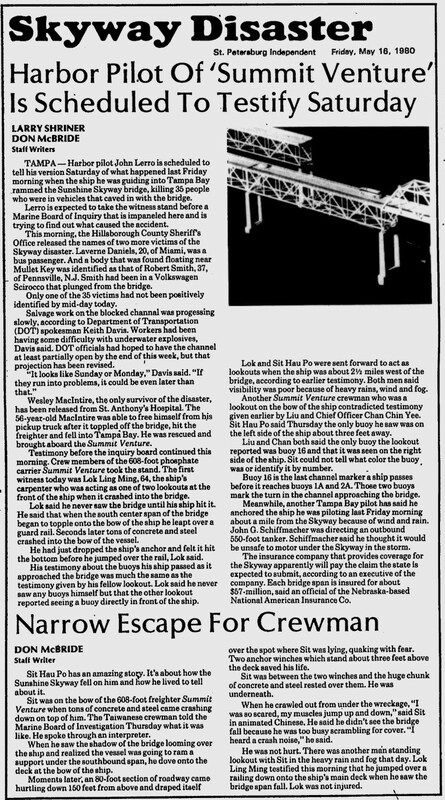 12.14.82: coast guard issues skyway tragedy report. 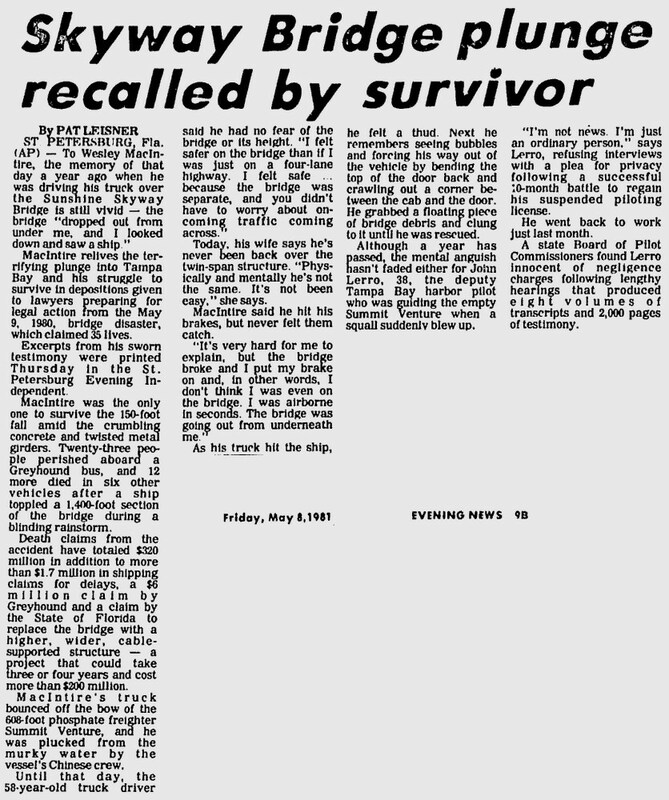 05.11.83: survivor still has nightmares about skyway disaster. 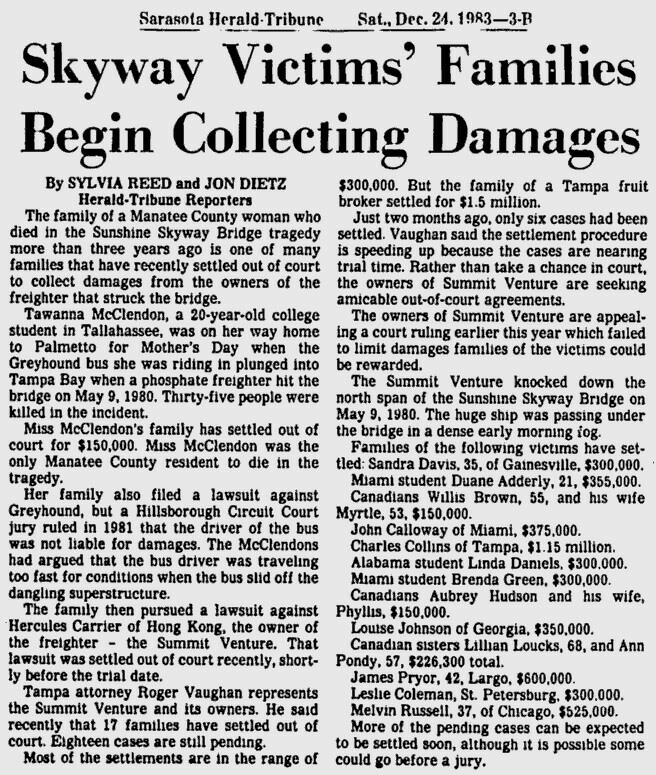 12.24.83: skyway victim's families begin collecting damages. 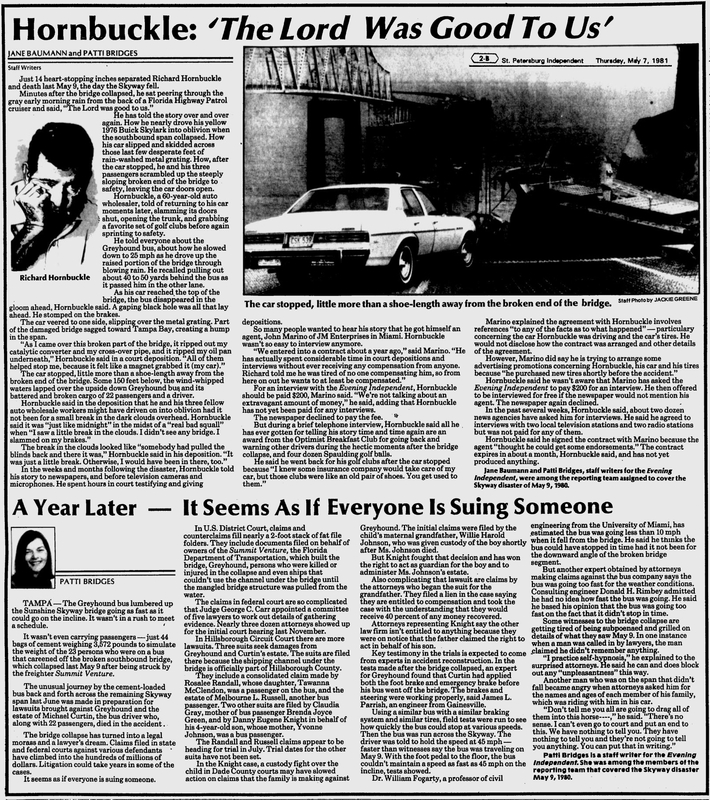 02.22.84: bus driver's family awarded $800,000. 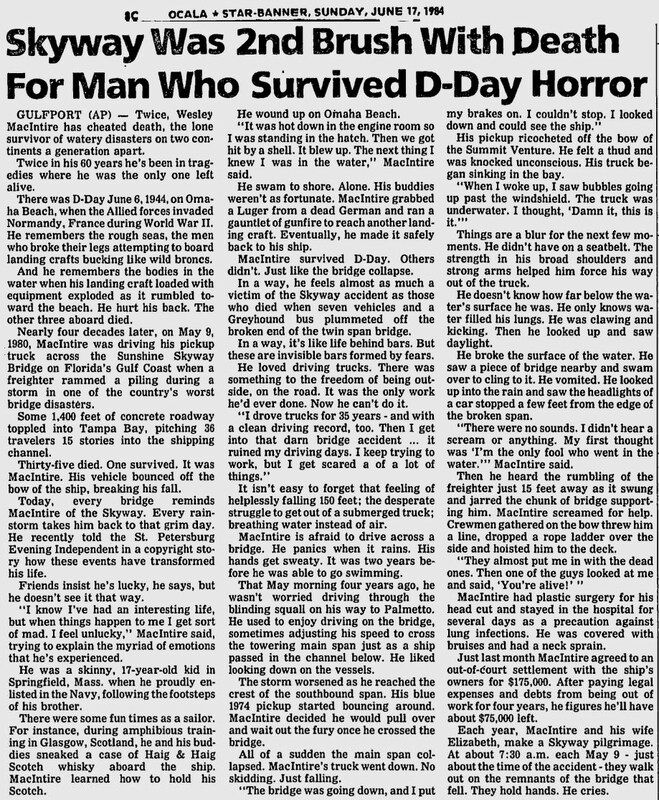 06.17.84: second brush with death for man who survived d-day horror. 06.19.84: rubble from skyway to be used as fishing reefs. 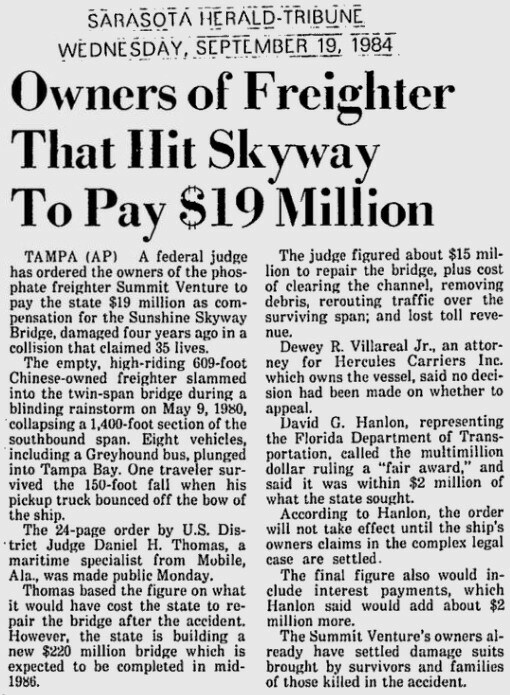 09.19.84: owners of freighter that hit skyway to pay $19 million. 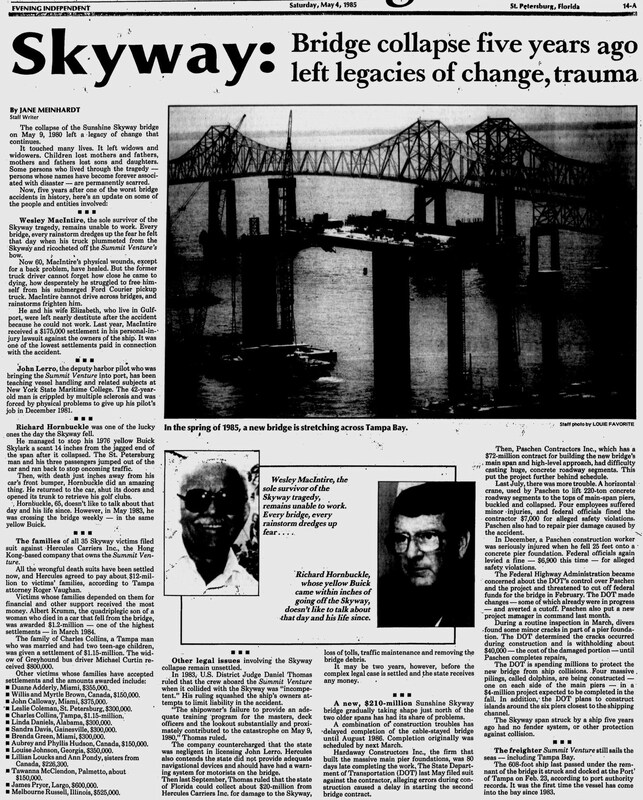 05.04.85: bridge collapse five years ago left legacies of change, trauma. 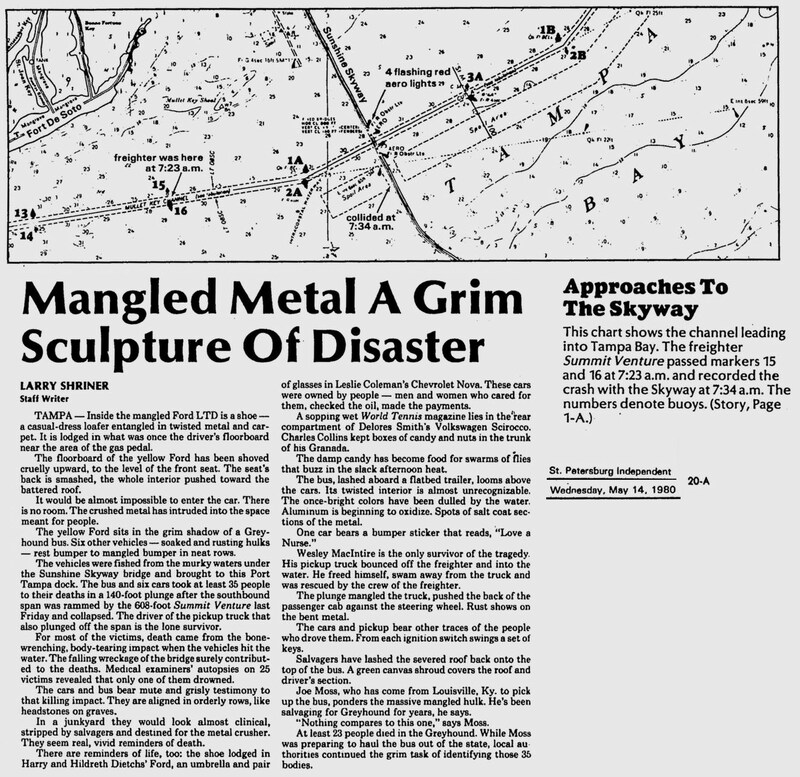 05.09.85: skyway disaster still haunts lerro. 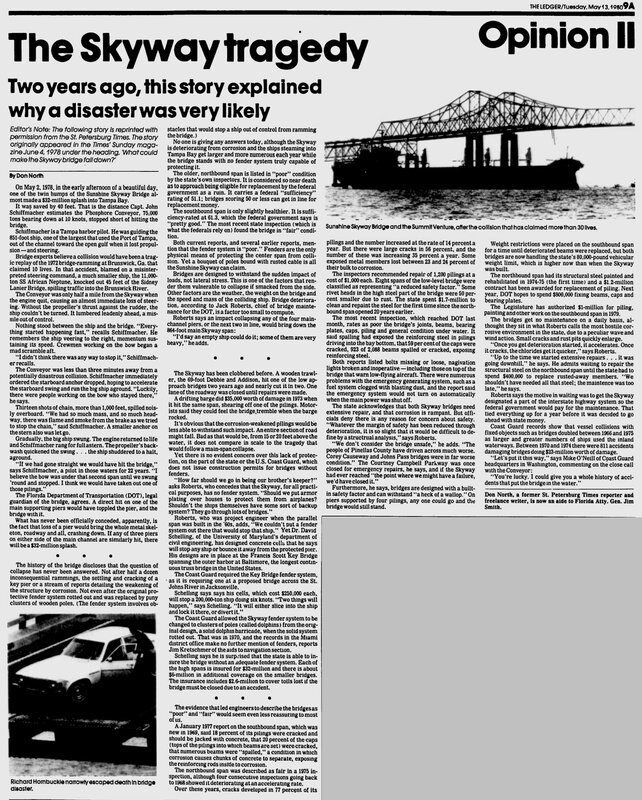 05.08.86: movie on skyway bridge crash planned. 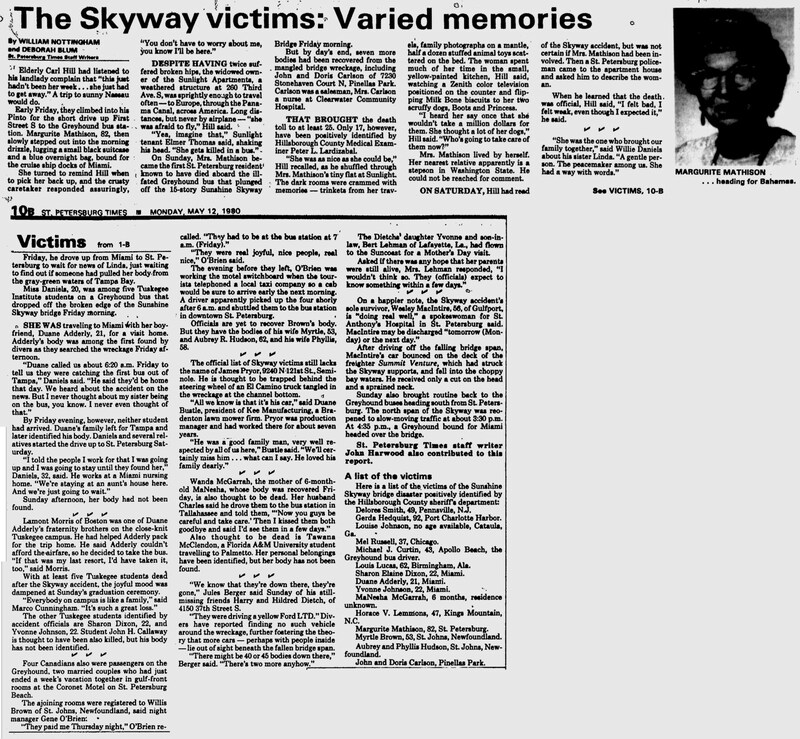 02.07.87: survivor tells of unease over skyway publicity. 02.08.87: bridge arches over disaster. 10.14.89: sole survivor, Wesley MacIntire, dies. 05.06.90: new concerns after disaster / ship pilot atones by counseling. 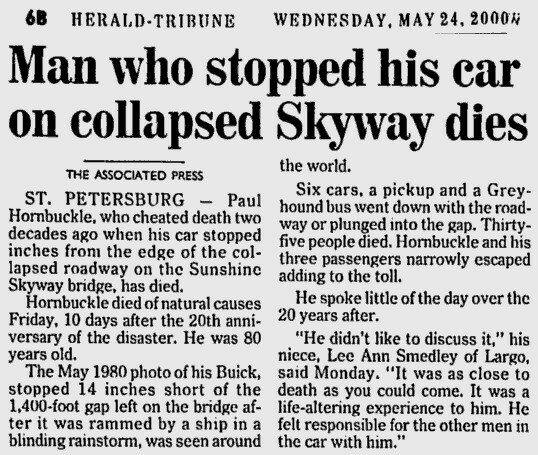 05.19.00: man who stopped his car on collapsed skyway dies. 05.07.05: 'mayday, mayday': the skyway's last 11 minutes. 07.29.09: the interstate 275 florida blog - the old sunshine skyway bridge. 05.09.15: npr.org, remembering the disaster: 'this is not explainable'. 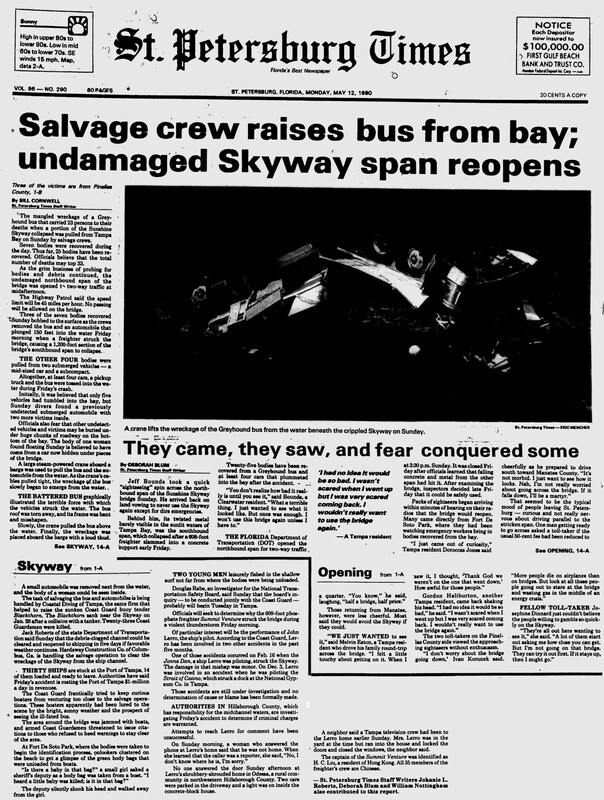 05.08.18: islander.org, 38 years since fateful day the Skyway went down. 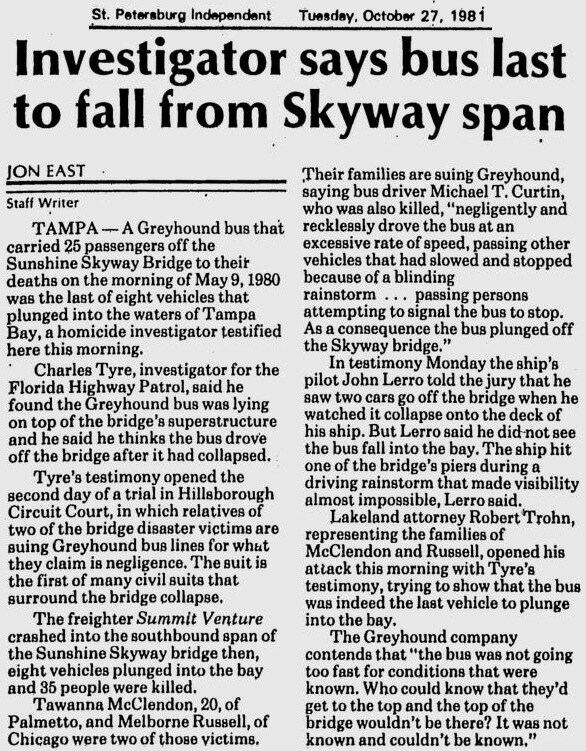 05.09.18: tampabay.com, the skyway plunged into tampa bay 38 years ago. 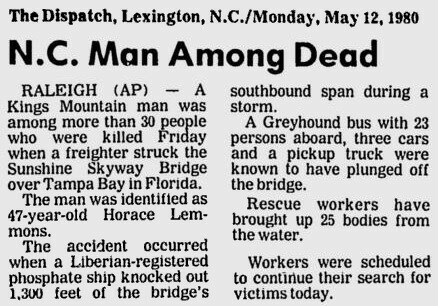 05.09.18: heraldtribune.com, photos: skyway bridge disaster anniversary. 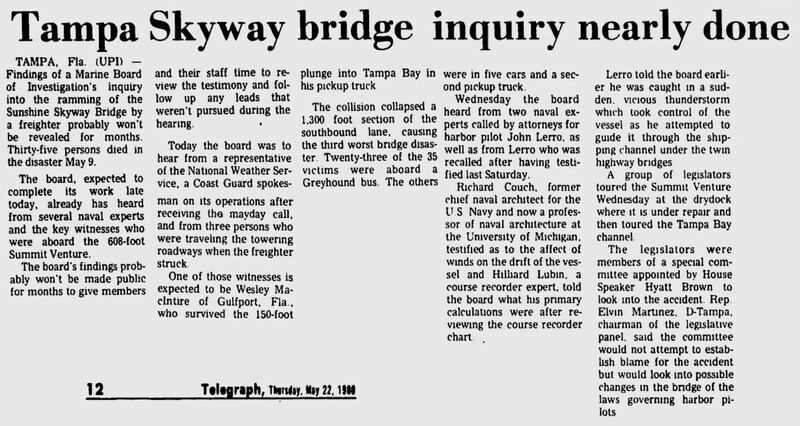 05.09.18: heraldtribune.com, sarasota’s connections to the skyway bridge disaster. 11.22.18: baynews9.com, filmmaker turns bridge crash into a documentary. 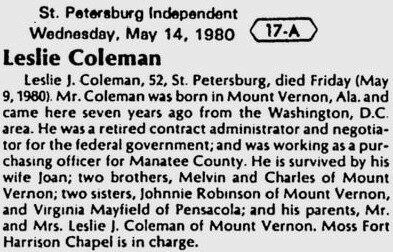 Wesley MacIntire, 56, Gulfport, FL. 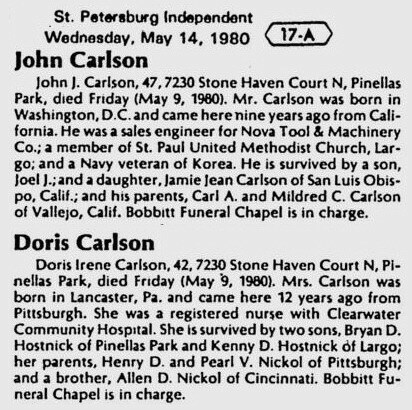 Doris Carlson, 42, Pinellas Park, FL. John J. Carlson, 47, Pinellas Park, FL. Charles L. Collins, 40, Tampa, FL. 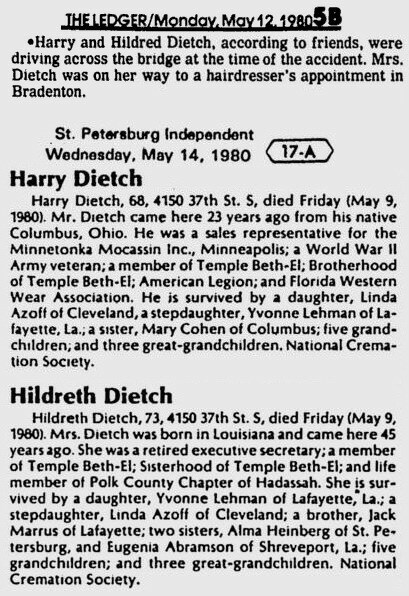 Harry Dietch, 68, St. Petersburg, FL. Hildred Dietch, 73, St. Petersburg, FL. James A. Pryor, 42, Seminole, FL. Delores E. Smith, 50, Pennsville, N.J.
Robert S. Smith, 37, Pennsville, N.J.
Duane P. Adderly, 21, Miami, FL. Alphonso Blidge, 22, Miami, FL. John H. Callaway Jr., 19, Miami, FL. Laverne L. Daniels, 20, Miami, FL. Sandra L. Davis, 34, McIntosh, FL. Sharon Dixon, 21, Miami, FL. Brenda J. Green, 19, Miami, FL. Robert D. Harding, 63, Glen Falls, N.Y.
Gerda Hedquist, 92, Charlotte Harbor, FL. Yvonne Johnson, 22, Perrine, FL. Horace V. Lemmons, 47, Kings Mountain, N.C.
Marguerite L. Mathison, 82, St. Petersburg, FL. Tawanna K. McClendon, 20, Palmetto, FL. Manesha McGarrah, 7 months, Tallahassee, FL. Wanda S. McGarrah, 24, Tallahassee, FL. Melborne L. Russell, 38, Chicago, Il. Woodrow Triplett, 33, Bainbridge, Ga.
Mel Buck, 37, got on the bus in Chicago? Jim Crispin, 61, St. Petersburg, FL. Kenneth Holmes, 40, St. Petersburg, FL. John Lerro, 37, harbor pilot. more. 05.09.18, Dana C., facebook, I was on that bridge when it happened. I was w my parents, brother & sister on our way to granny’s house on vacation. We were the 3rd car behind the gray hound bus that was rocking back & forth before it went off into the ocean below. I was standing n the back seat & looking out the window. I could see & hear the people n the car that was falling into the ocean yelling & screaming for help. I was 5 years old. 12.08.16, Steve S., I boarded a Greyhound bus in Gainesville which I believe to be the one that went off of the Skyway Bridge. I was on the way to Naples Florida where my parents lived. I got on the bus, then had a change of mind. I rarely went to class, yet didn't want to take criticism for not being in school in the middle of the week. I got off the bus and returned my ticket for a loss. Then next morning my roommates told me about the disaster. Just looking at your site, so thought you might like this info. 05.10.11, Tara H., Boston, MA.,	facebook, My grandfather, Robert D. Harding of Glens Falls, NY, was riding the Greyhound bus which fell into the bay. My Mother, an only child, learned of the loss of her father on the evening (late?) news that Mother's Day. My grandfather was returning home after a job of driving someone's (who chose to fly) car to Florida. The next day, my parent's picked us up early from school and we traveled to the hospital to tell my grandmother, who was recovering from a heart attack in the ICU. I was ten years old and vividly remember being told as I sat at the kitchen table. I started crying while staring at the cover of a math text book. The image of that book always comes to mind. This was experience with the death of a family member. At the wake/funeral I learned that the casket was closed because his body was contained in an insert inside. I vaguely remember my Mother calling it a ziggy. ... Thank you for letting me share. 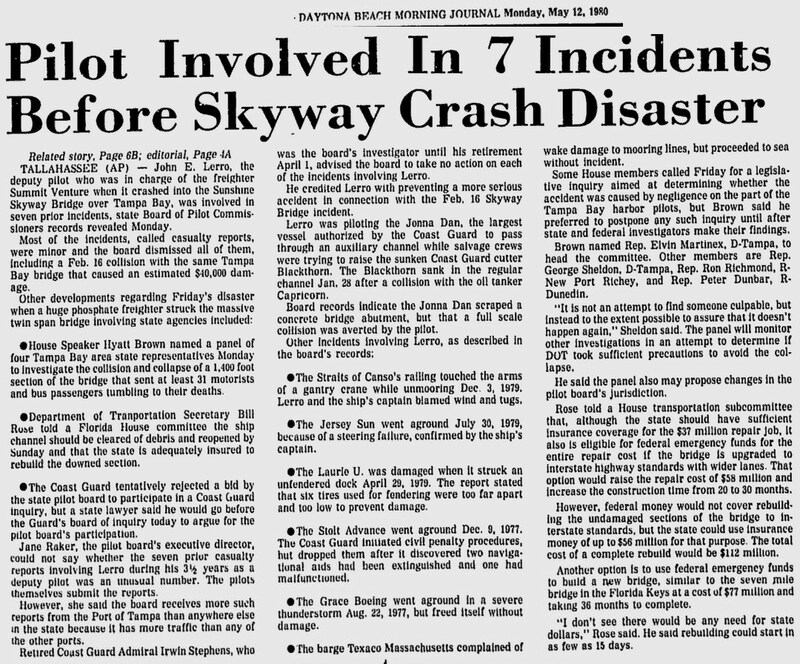 have a skyway disaster story or remembrance? 10.23.13, wgcu.org, speaking with Bill DeYoung about his book, 32 minutes. Behind every tragedy, there are stories of happenstance, intent and neglect that never see the light of day. 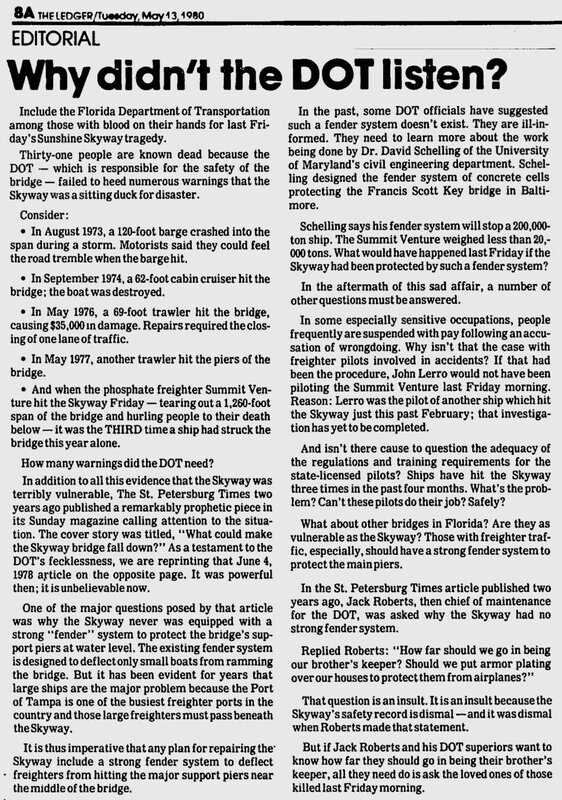 For St. Petersburg native Bill DeYoung, the questions behind the story of the 1980 collapse of the Sunshine Skyway Bridge were too many to ignore. 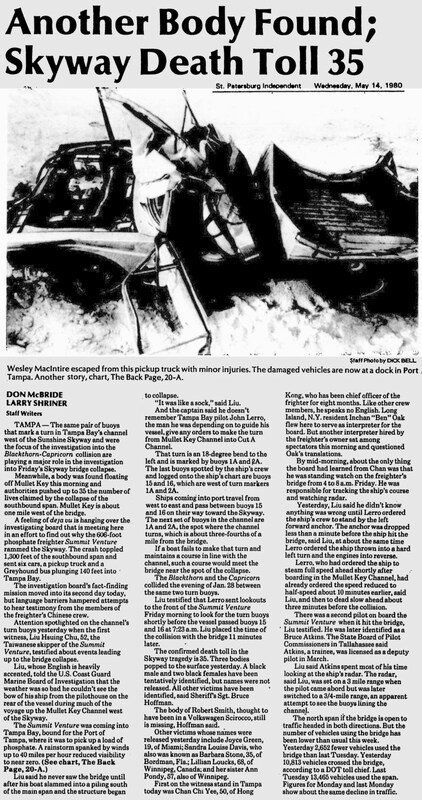 What began as leisure reading on the 30th anniversary of the accident grew into an immersion into the details of the event that ended in the death of 35 people and the lifelong burden of guilt for the man many blamed for the accident. "I couldn't stop thinking about it," DeYoung said. "I just started asking a lot of questions not thinking it would be a long-term project. The more I read, the more I wanted to know." 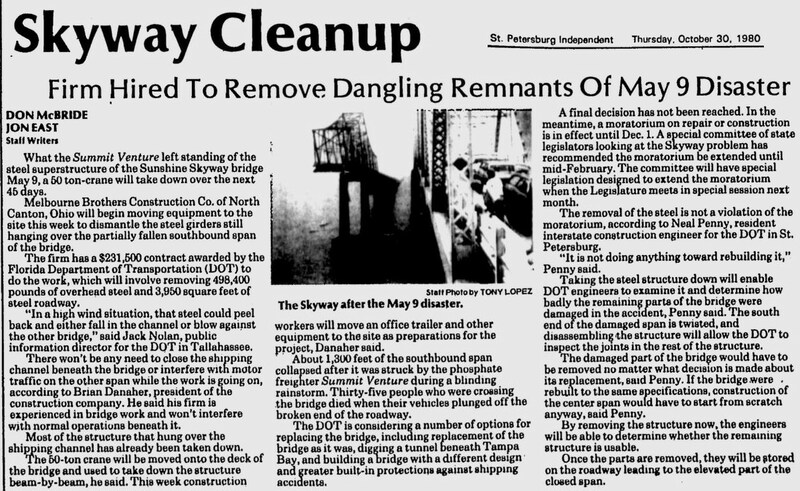 The result, three and a half years later, is DeYoung's first book, "Skyway: The True Story of Tampa's Signature Bridge and the Man Who Brought it Down" (University Press of Florida, $24.95). The author will discuss how "Skyway" came to be at two Friends of the Library events at 1 p.m. today at the Tower Road Branch Library, and 3 p.m. Sunday at Headquarters Library. "I knew I would write some sort of book, but I thought it would be music-related," said DeYoung, a nationally recognized journalist who has covered music at several Florida newspapers, including The Gainesville Sun, for some 30 years. "This came out of left field. I read different accounts of what happened, and the details — some big details — differed. As a journalist, I wondered which (story) was true." 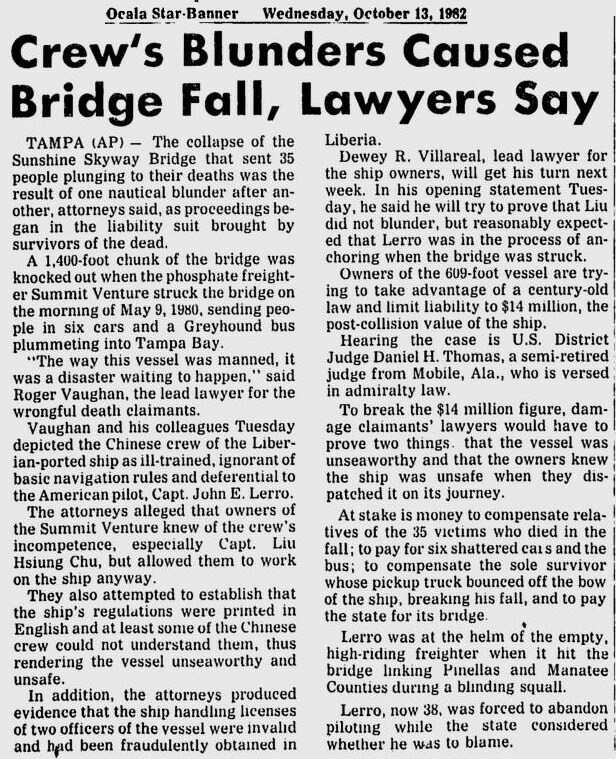 An article two years after the accident attempted to revisit the tragedy, but no one had ever written an in-depth story of what occurred on May 9, 1980, when a 600-foot freighter collided with a support pier causing the bridge to collapse 150 feet into Tampa Bay. Seven cars and a Greyhound bus fell into the water below. The book weaves together personal interviews and extensive research to reconstruct how Florida's mightiest bridge was built and then destroyed, and how the horrendous accident effectively cast a pall over the life of harbor pilot John Lerro. DeYoung recalls how, nine months into his research, a friend's comment drove home the need for a detailed account of the events of that day, including the story of the harbor pilot, who was cleared by federal investigators of wrongdoing. "That was a pivotal moment when I said, 'I have to tell this man's story,' " DeYoung said. "(Lerro) never forgave himself. Until the day he died, he blamed himself." The Tampa Bay Times shared archive photos of the event for the book, and DeYoung pored over transcripts of court documents and anniversary stories of the collision in his research. Over time, he also was able to gain the trust of Lerro's friends and family members, including Lerro's son, Chance, who was 13 at the time of the accident. "Lerro was made a scapegoat, and (he was seen) as a villain, and he wasn't," said DeYoung, 55, who works for the alternative weekly, Connect Savannah. "It took time for (his family and friends) to accept that I just wanted to tell a story." What emerges is a story DeYoung hopes will put to rest questions of how and why an accident so devastating occurred in the first place. 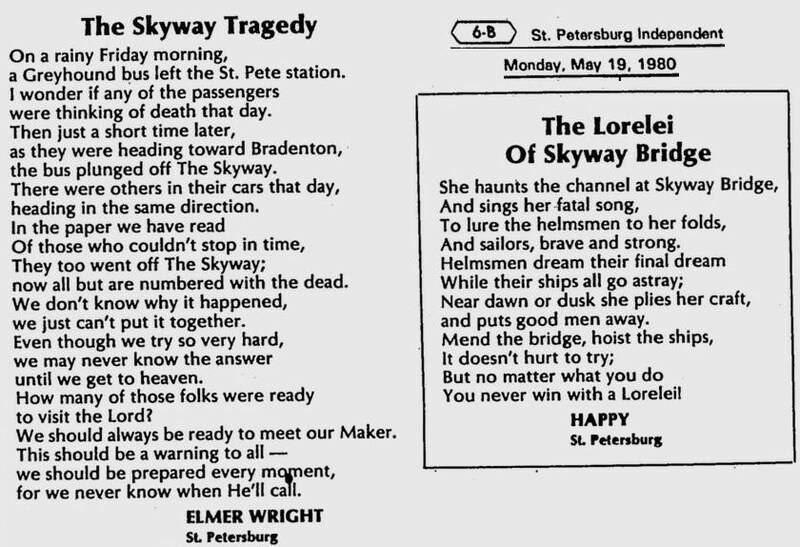 A personal note of satisfaction, he said, is knowing "Skyway" provides readers with a more accurate history of what happened — a retelling that may not have benefited Lerro, who died in 2002. 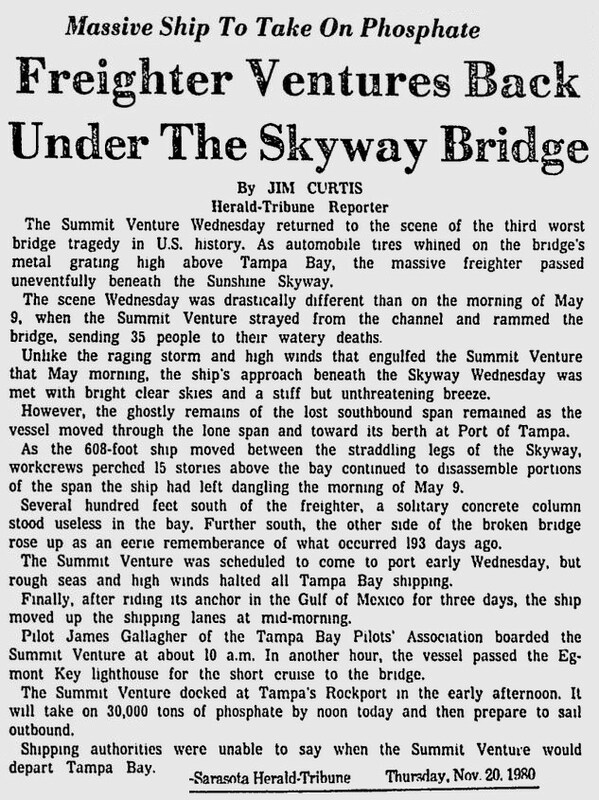 05.05.15, wusf.usf.edu, Florida Matters: Sunshine Skyway Bridge Disaster 35 Years Later. This week on Florida Matters, we'll take a look at the disaster with Bill DeYoung. He's the author of "Skyway: The True Story of Tampa Bay's Signature Bridge and the Man Who Brought it Down." In this preview, DeYoung describes what happened at 7:33 on the morning of May 9, 1980. On today’s Topical Currents, we recount the terrible events which caused the collapse of Florida’s Sunshine Skyway Bridge. 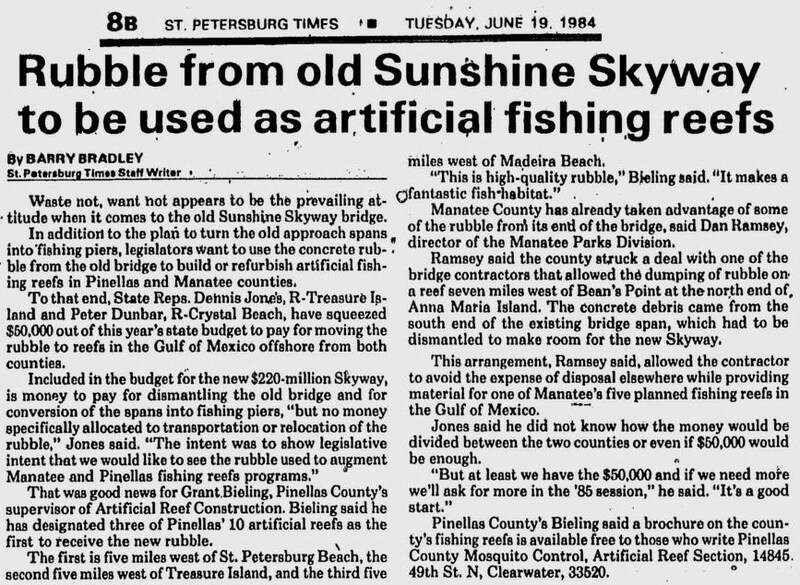 Writer and editor Bill DeYoung, has researched events for the book, SKYWAY: The True Story of Tampa Bay’s Signature Bridge, and the Man Who Brought It Down. 01.31.14, tampabay.com, opinion: Bay area needs 'Summit Venture' memorial. On Jan. 28, the U.S. Coast Guard held a ceremony in the rest area at the north end of the Sunshine Skyway Bridge to honor the 23 crewmen who perished in the 1980 sinking of the cutter Blackthorn in the area near the shipping channel. Dedicated in 1981, the Coast Guard's 8-foot granite monument is a thing of solemn beauty. 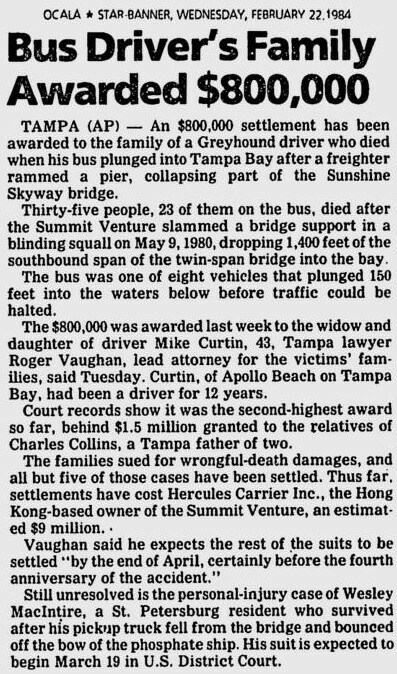 Why is there not a similar memorial to honor the 35 private citizens lost on May 9, 1980, when the freighter Summit Venture took down 1,300 feet of the Skyway in a violent squall? 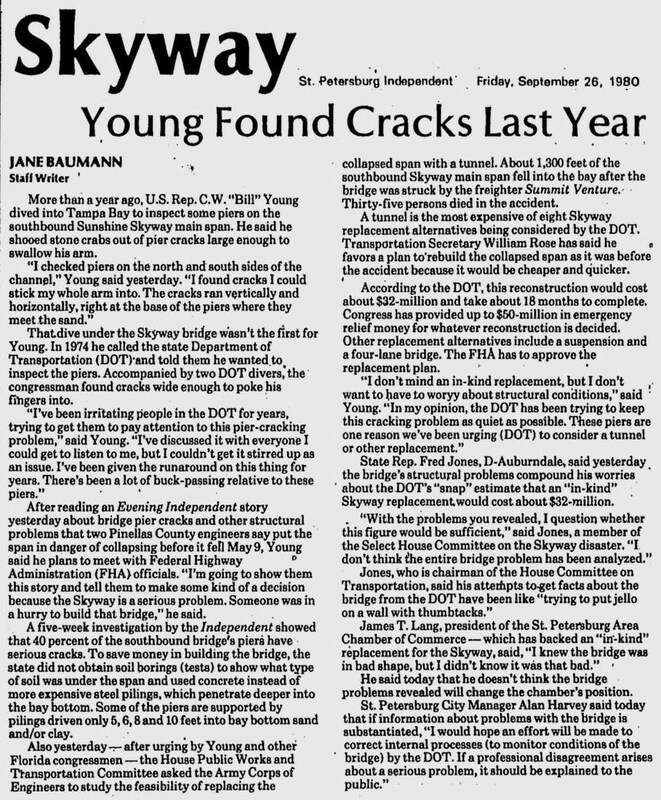 As a St. Petersburg native, and the author of Skyway: The True Story of Tampa Bay's Signature Bridge and the Man Who Brought It Down, I have been trying for nearly a year to jump through whatever bureaucratic hoops are necessary to right this egregious wrong. The Florida Department of Transportation, the custodian of the rest area (known as Blackthorn Memorial Park), took six months to discuss my proposal, only to tell me in the end that it could not be done without an act of the Legislature. My repeated requests for assistance were ignored by U.S. Rep. Bill Young, state Sen. Arthenia Joyner, and former governor and senator Bob Graham (who, ironically, was interviewed extensively for my book). 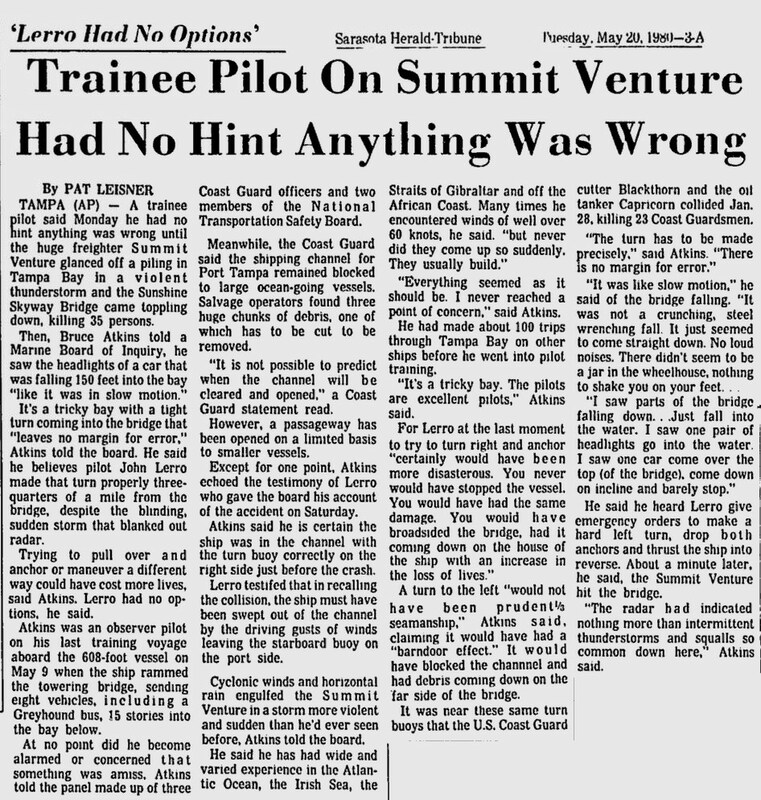 The Summit Venture disaster remains the worst ship/bridge collision in American history. And, as many of your readers will remember, perhaps the darkest moment the Tampa Bay area has ever known. To my knowledge, there is not a single public mention of the tragedy anywhere in Pinellas or Manatee counties. I can only surmise that the state of Florida is trying to pretend it never happened. 12.01.14, tampabay.com, Author behind memorial for victims of Sunshine skyway disaster. 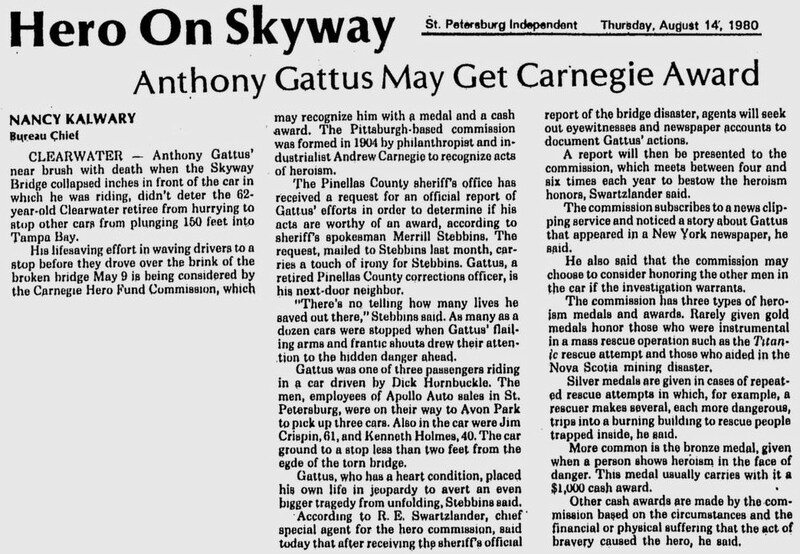 12.01.14, abcactionnews.com, Author plans a memorial for Skyway Bridge disaster victims by next year. BRADENTON - Mel Russell lived a hardscrabble life, and by 1980 he was separated from his wife, drinking a lot and staying in Room 338 of the Wilson Avenue Club for Men, a dingy hostel in a seedy section of Chicago. Julie Russell loved him anyway. She was living with her sister in north Sarasota, and one night she called her estranged husband to say their son had been bitten by a rat and she feared it was rabid. 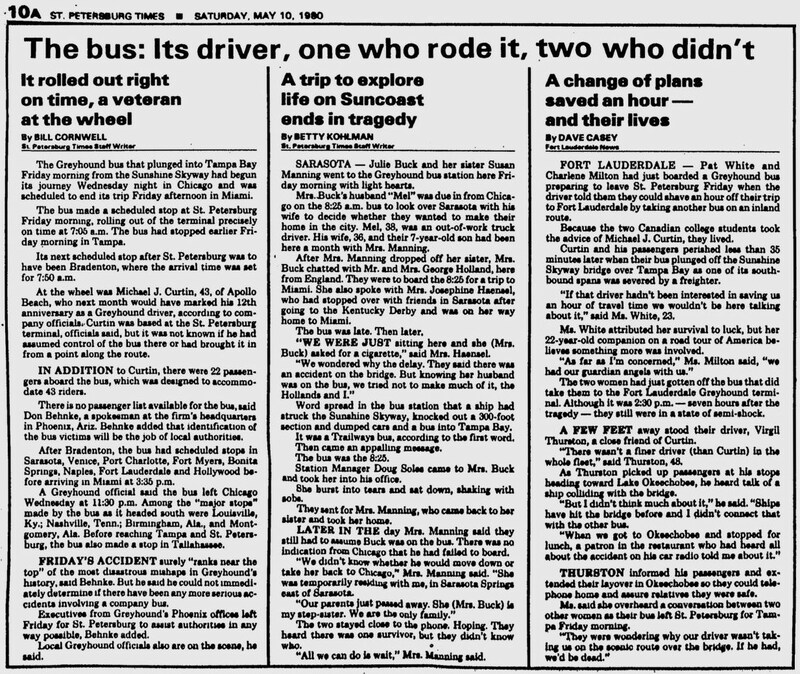 Mel Russell was so concerned that he scrounged up $125 for a bus ticket and this thrilled Julie as she was hoping the couple could reconcile and live in Sarasota with their son. 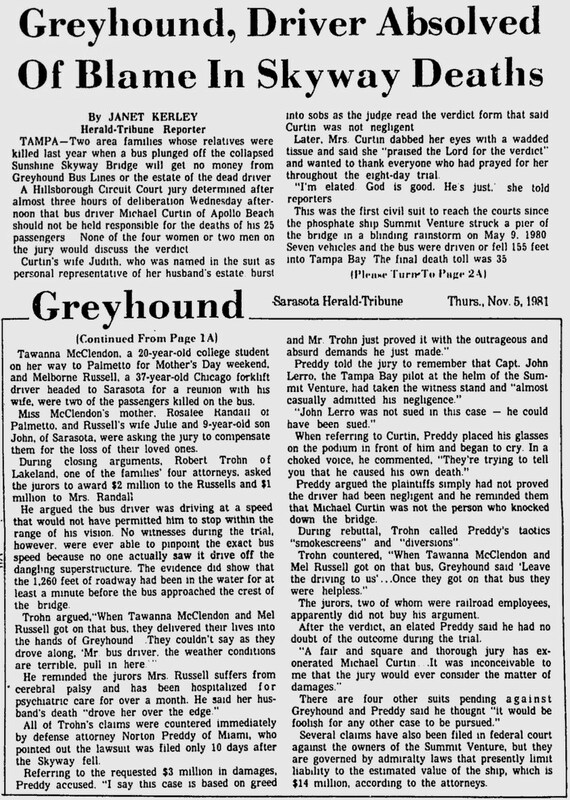 On the morning of May 9, 1980, when Greyhound No. 4508 was expected to arrive in town, she was at the bus station eagerly awaiting him until a coin-operated television blared out something so shocking that she would eventually be found living in an abandoned warehouse because of it. Her husband was not coming back to her. A 600-foot freighter had struck the Sunshine Skyway Bridge, plunging the bus, six cars and one pickup into Tampa Bay. All told, the lives of 35 people ended, some with little-known ties to this area. It will be 35 years this May, and after all this time there really has been nothing to memorialize those who perished. Bill DeYoung, a St. Petersburg author of a book on the disaster, plans to change that. DeYoung is director of a non-profit raising money for a granite memorial for the victims. It will be placed near the southbound rest stop of the bridge. In 2014 the Florida legislature passed a bill allowing the memorial, and DeYoung is now trying to raise $8,000. It will be a simple monument, he says, with the names of the victims on it, but the names will not tell the full story of those with area connections and the twists of fate that led them to their deaths. Many of the details about the area connections were provided in a book published shortly after the disaster called “Bridge Down.” It was written by the late George Mair. A Georgia man named Woodrow Triplett was aboard the bus and on his way to Sarasota, just like Mel Russell, only he was running from the law for check forgery. He boarded near Bainbridge, Georgia, with his girlfriend Sandra Davis, and they bought their tickets using the aliases Alvin and Barbara Stone. They planned to start a new life in the area. Tawanna McClendon had sickle cell anemia and was studying to be a nurse at a community college in Tallahassee. She was on the bus, heading to Palmetto for Mother's Day, dying horrifically just miles from home. Gerta Hedquist of Punta Gorda was the oldest victim at age 92. She had chronic arthritis, and just weeks before the accident a doctor had cleared her to travel to her native Sweden for the last time in her life. 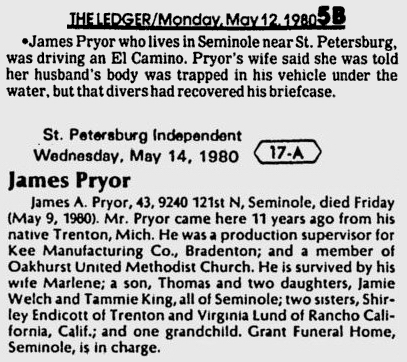 Jim Pryor lived in Seminole but was a manager at Key Manufacturing in Bradenton. He drove over the bridge each day in his El Camino. On May 9, he was on his way to Bradenton when he realized he did not set out his trash cans and he returned home to do it. Had he just kept driving he would have lived. There was actually someone who went off the bridge in his pickup truck and survived. His name was Wes MacIntire from Gulf Port and he never overcame the guilt of being the lone survivor. He was on his way to work at Palmetto Meat Dispatch that day. He formerly worked at Tropicana in Bradenton, training truck drivers, DeYoung says. And as with any tragedy of such magnitude, there were also those who narrowly escaped death. Betty McCoy was one such person. She just made it over the bridge that morning. She was on her way to Moody Elementary in Bradenton, where she had worked for 11 years. She arrived at Moody not knowing what happened and when she got out of her car she had no idea why people were running up to her and hugging her with tears in their eyes. 01.31.15, bradenton.com, 35 who died when Skyway Bridge collapsed to be memorialized. 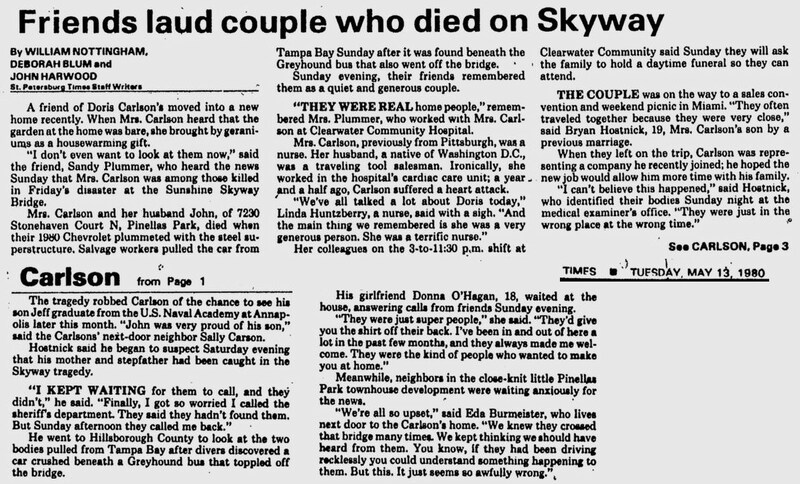 01.31.15, tbo.com, Victims of 1980 Skyway disaster to be memorialized. 02.03.15, baynews9.com, Man raising money for Sunshine Skyway Bridge memorial. stats: 6 feet high, 3 feet wide, 2300 pounds. 05.09.15, tbo.com, Memorial’s dedication recalls Skyway tragedy in May 1980. 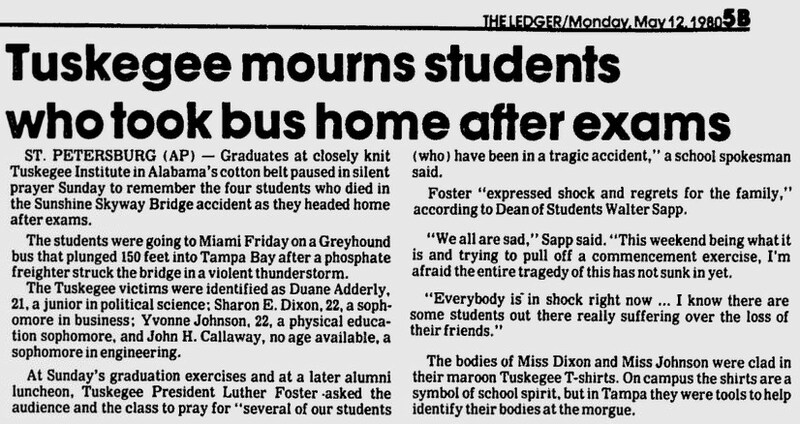 ST. PETERSBURG — In Tuskegee, Alabama, two college buddies boarded a bus bound for Florida. In Tallahassee, a young mother and her baby girl joined the bus route headed south toward Fort Lauderdale. That same morning, a father told his family goodbye before riding off on his usual peaceful commute across the Sunshine Skyway Bridge. All of them were crossing over Tampa Bay during the sudden, violent storm on May 9, 1980, when a freighter ship rocked by rough seas collided with the bridge, knocking out the center of the southbound span. A Greyhound passenger bus fell off the broken structure and plunged 150 feet along with six cars and a pickup truck. Names of the 35 who died now are memorialized in a granite monument funded by private donations in an effort organized by local author Bill DeYoung, who documented his community’s tragedy in a book. The bay waters were placid Saturday at a roadside park within sight of the taller bridge that replaced the old Skyway. Even after 35 years, the families of those who perished remain haunted by that dark day. Charles McGarrah’s future wife told him something strange when they met — at a table in the lobby of Florida State University’s DeGraff Hall. “She said, and I repeat, ‘My name is Wanda Smith and I will not live to see my 25th birthday,’ ” McGarrah said. His newfound love also vowed never to marry or have children. The pain of her sisters’ divorces was too severe and the world too full of hate to bring a baby into it. The couple overcame those fears and had a baby girl, Manesha. 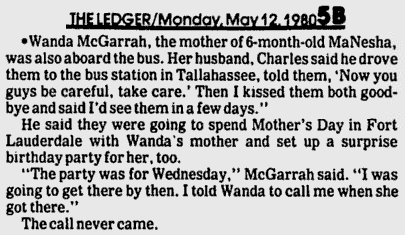 A few months later, in May, mother and daughter planned to ride from Tallahassee to Fort Lauderdale for grandmother’s birthday. Before this, Wanda had nightmares of falling with people surrounding her. “I wish you were coming with us,” she told her husband. “Not, ‘I wish you were coming to Fort Lauderdale because of my mother,’ but ‘I wish you were coming with us,’ ” McGarrah said. It was too late to get a bus ticket. 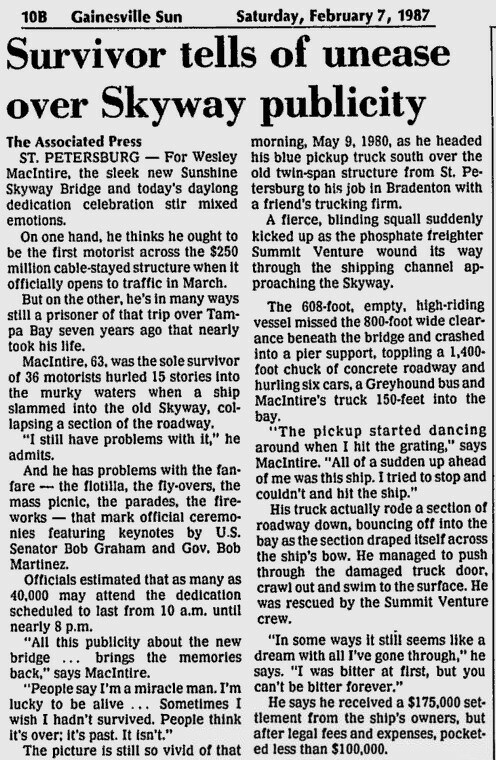 Later that evening, McGarrah heard buzz on the news about a bus falling off the Skyway Bridge, a familiar spot for the St. Petersburg native, but he didn’t think it could be that one. When a family member from Fort Lauderdale called to let him know Wanda and Manesha had not arrived, he turned on the television again and saw a Greyhound being pulled from the bay waters. “I knew in my heart that they were on that bus. No confirmation, but in my heart, I knew,” he said. Wanda would appear to him in dreams, before her funeral, urging him to read the last poem he wrote for her rather than stay silent. He remembered her admonition that he should remarry, should something happen to her, but he should never compare her to another. McGarrah did as she asked, but memories from his young marriage were fresh on his mind Saturday as he read from a poem he wrote shortly after the tragedy. “How can we see and yet not feel the intensity of our worth in life and know that God is forever by our side strengthening us through each change that life may bring to us?” he said. Tammie Pryor King says her father was content raising a family, meticulously grooming his tropical Florida yard – even vacuuming the rocks in the flower beds – and driving to work each day in his Chevy El Camino. “One morning I remember saying to him, ‘Dad, aren’t you afraid or don’t you tired of going over the Skyway bridge?” King recounted. When Tammie and her husband heard about the Summit Venture freighter hitting the bridge, they jumped in the car and headed for the site, half expecting to see her father helping to rescue crash victims. “My heart sunk when I found my dad’s briefcase. I opened it up and he had joke books and a Bible, but I was still hopeful he survived,” she said. By that night, the rescue had turned to a recovery and she knew. King told Saturday’s audience, which included many of her father’s 10 grandchildren and seven great-grandchildren, not to be afraid of crossing the bridge. “When you drive over the Skyway bridge, don’t drive over with fear. Look down at the water like I do to the west going south, where he went down, and remember my dad, James Aaron Pryor, and know that he was at peace when his life ended,” King said. The rain had been coming down in sheets since they crossed the line from Alabama into Florida, and it continued at a stop in Tallahassee. Lots of students from Tuskegee were on the bus. Lynwood Armstrong got off the Greyhound in Tampa, leaving his buddy, John Callaway Jr., to make the rest of the trip down to Miami. He heard about an accident on the bridge and called Callaway’s parents, but they couldn’t get any information. “A few hours later, I watched them pull that bus out of the water and I knew right then that was the bus I was on,” Armstrong said. Today, he said, he can still hear Callaway’s mother screaming on the phone. Armstrong would remain close to his friend’s mother and now late father through the years. He says they nurtured his faith, assuring him that even this tragedy was in God’s hands. “I can’t wait till that day to see him and his father at the Pearly Gates,” he said. Belinda Jackson entered her teenage years without a mother. Her recollections of the day her mom died aren’t as vivid as thoughts of how she has missed meeting Jackson’s three children and a grandchild. Jackson’s family wore T-shirts Saturday with a portrait of Sandra Davis. Davis’ children have struggled for years with depression, anxiety and feelings of anger, but mostly with loneliness. “I wish I could tell her she’s rich in grandchildren,” Jackson said. Decades after the loss, though, Jackson says the memorial to her mother and the other victims, the stories of others who also have lost and overcome, finally have given her heartbroken family a measure of closure. “Words cannot explain. Words cannot explain,” she said. She thanked DeYoung, the author who helped organize the monument, then Jackson turned back to the audience, many of them sweating in the late-morning sun. There was hardly a breeze on the bay. “We don’t know the time, the hour, the minute when it will be the last,” she said. 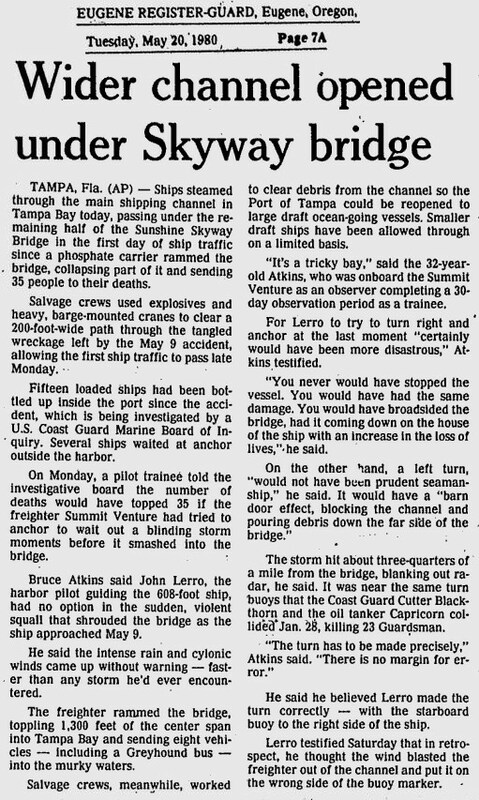 TAMPA, Fla - It has been 35-years since the freighter, Summit Venture, in a severe storm veered off course and crashed into the old Skyway Bridge. 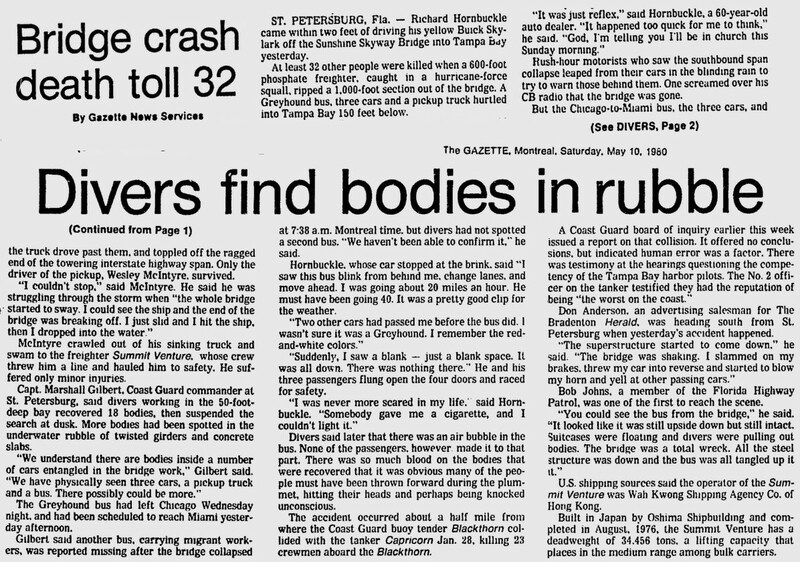 35 people were killed in the accident when a section of the bridge collapsed, falling into Tampa Bay. This morning, a new six-foot granite memorial was unveiled during a public ceremony next to Blackthorn Memorial Park. 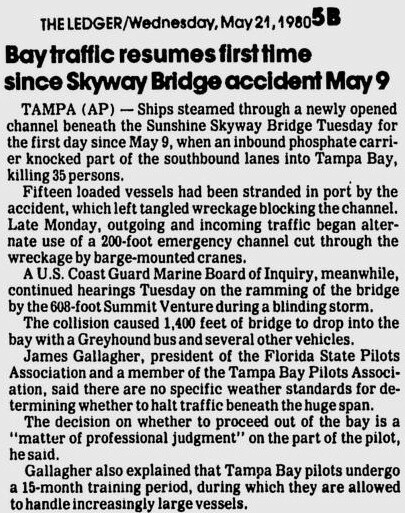 TAMPA, Fla. — On Friday, May 9, 1980, the freighter Summit Venture, blinded by a storm, collided with the southbound extension of the Skyway Bridge. 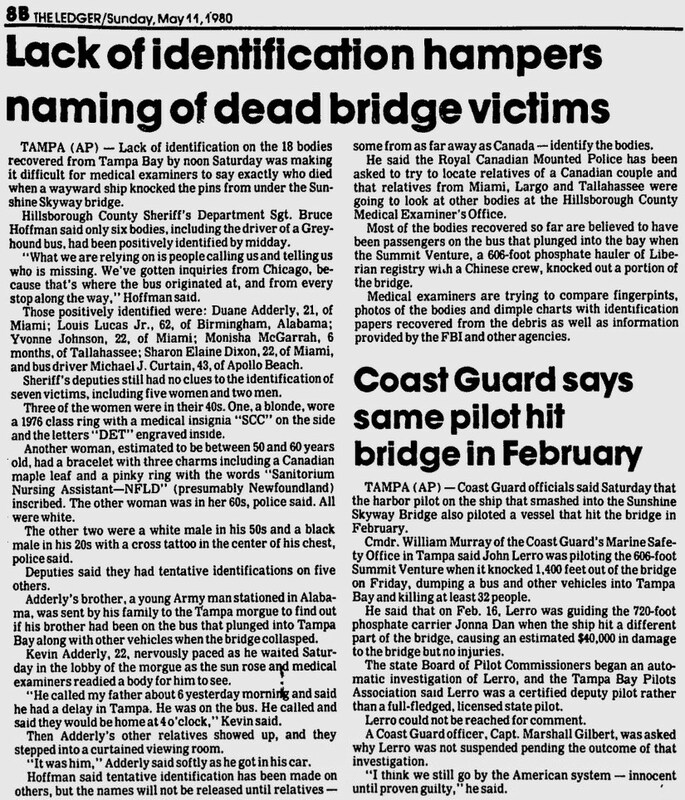 The result caused a 1,200 foot span of the bridge to collapse into Tampa Bay eventually, taking the lives of 35 people travelling across the bridge. Now, nearly 39 years later, producers are turning on of the worst disasters in the Tampa Bay area history into a documentary. “We're telling the story through (the eyes of the captain’s lawyer Steve Yerrid), and of course all the people that were involved, from the state attorneys who investigated it, (and) other state legislators that were a part of building a new bridge,” said producer and director Kenny Alfonso. 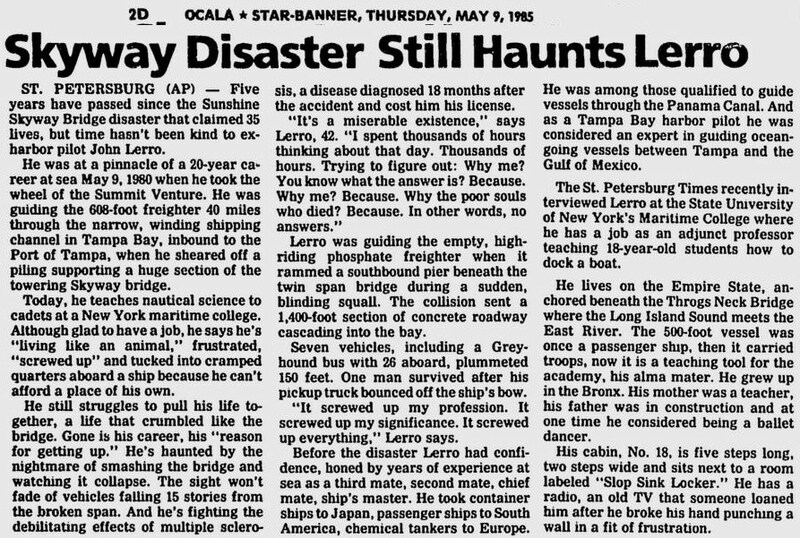 A native of Tampa, Alfonso says he not only remembers the day of the tragedy, but he also remembers how the freighter’s captain John Lerro was treated in the aftermath. Former Gov. 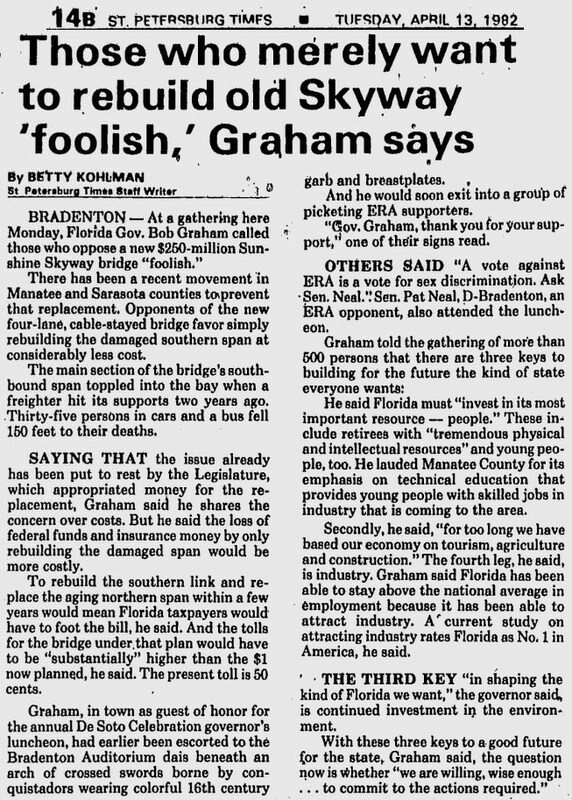 Bob Graham oversaw the construction of the new Skyway Bridge that carries his name is taking part in the documentary. He hopes it serves as a reminder of lessons learned the hard way. 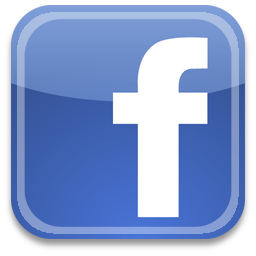 facebook.com, skyway bridge disaster documentary. skywaydisaster.com: website dedicated to the collapse. videos and pictures about the collapse.